Today I drove to the Tucson Airport to meet my Australian friend of fifty five years, Mary. She was visiting, not only to celebrate our long friendship, but also my eightieth milestone birthday, which was to be a double event, first with a party in Tucson, then a special dinner in Vancouver with family and friends on the actual day. Prior to leaving the airport I turned the odometer back to 0.0 ready to record the distance Mary and I would travel together during her visit. This was not Mary’s first visit to Tucson as she and I had spent four days here back in 1999. At that time we visited Kitt Peak, Saguaro National Park, Organ Pipe National Monument and the Biosphere, so we were able to take time for Mary to recoup from jet lag, run a few pre-party errands and prepare for Saturday’s party. *About forty five people attended my party, and, it being a beautiful day we did not have everyone squished inside the house but were able to set up tables in the backyard as well. We provided all liquid refreshments as well as two birthday cakes - one white and one chocolate, and had asked our friends to bring something to share. Wow! And what a spread was provided. Today we went to church and otherwise cleaned up after the party and relaxed, ready for a few days of sightseeing before Mary and I set out for our drive to Vancouver. Starting to plan for our trip to Vancouver we went to the AAA for maps and travel books. After this we drove to a friend’s house in the foothills to see her natural desert garden and we were blessed to see cholla, ocotillo, prickly pear and Saguaro in bloom. Then we went to Tohono Chul Park, a really great place to take visitors to Tucson. Here we had the good fortune to see a desert spiny lizard and the desert tortoise as well as some flowers in bloom. Today we drove east on Interstate 10 to the Dragoon Mountains, a fascinating area of massive granite rocks scattered over the landscape. We stopped briefly at the Texas Canyon Rest Area, a popular place to view the rocks, then continued on as far as Johnson where we had a light lunch. We returned through Texas Canyon leaving the highway at Dragoon Road to go to the Amerind Museum and Fulton-Hayden Memorial Art Gallery, a gem in the desert which I originally found by accident! The Amerind Foundation is a museum and research facility dedicated to the preservation and interpretation of Native American cultures and their histories. Its facilities are located near the village of Dragoon, Arizona in Cochise County, about 65 miles east of Tucson, Arizona in Texas Canyon. William Shirley Fulton (1880–1964), an archaeologist, established the Amerind Foundation in 1937. The Amerind Foundation's building was designed by Tucson architect Merritt Starkweather and contains one of the finest collections of archaeological and ethnological artifacts in the country as well as a sizable research library. According to the Foundation's literature, "Amerind" is a contraction of the words "American" and "Indian". Today we went to St. Philip Plaza where Mary was interested in looking at Indian pottery and jewelry. After this we went for a drive along one of my favorite roads, River Road, as far as we could, then on through some of the eastern suburbs. With a desire to show Mary around my own local area we drove to the western end of Ina Road in the foothills of the Tucson Range, wound through the area known as Sunflower, then back along Silverbell to the Mexican restaurant, La Olla, where we met a friend for lunch. In the afternoon I had an appointment to have a cortisone shot in my knee because of the pain I had been experiencing. From here we went downtown to browse through Artisans of Tucson and Tucson Presidio. Arrangements had been made for us to have a late afternoon visit with some friends in Picture Rocks to see all the birds which come into their yard, especially the Gambel’s quail. We decided to go through Gates Pass in the Tucson Range then drive north to Picture Rocks. In the evening we went for another drive, this time for me to show Mary how dark the suburbs are with no street lighting. Although Tucson has grown to a city of about 1,000,000 since Kitt Peak National Observatory in southern Arizona was started in 1958, Tucson has one of the world’s most progressive light-reduction city ordinances. This morning we were out and about running a few errands and stopped in to see a photographer friend. She shows her work along with other artist on the first Friday each month at a local strip mall. After this we decided to go to the AAA again and have an agent make reservations for us for our first two nights out. That way if we were late arriving at our chosen destination we would not to be hunting for accommodations. We had a quick trip home for lunch then went to the DeGrazia Gallery, which showcases DeGrazia’s diverse talents as sculptor and his wonderful paintings of Native American children, amazing images of horses and American Southwest scenes. It is fun to walk through the grounds as well as tour the gallery and is always a great place to take visitors to Tucson and the description below tells you why. On the National Register of Historic Places, this legendary landmark of Southwestern art and architecture was designed and built by acclaimed Arizona artist Ted DeGrazia. The 10-acre foothills site includes the adobe gallery with permanent and rotating exhibits, chapel with interior murals, gift shop, cactus courtyard, the artist’s home, and his grave. Plenty of parking, handicap accessible, free admission. Open daily 10-4, closed on these days: New Year’s, Easter, Thanksgiving and Christmas. Besides going to church Sunday morning we stayed around home preparing and packing for our trip to Vancouver. 495.7 7:30 We left the house drove to Fry’s to fill up with gas so we would be setting out with a full tank. At this point I turned the odometer back to 0.0 for our trip to Vancouver and beyond. 0.0 7:45 Leaving from Fry’s gas station on Silverbell. We are on our way and excited about the big expedition ahead, first the driving tour, then time in Vancouver followed by the Alaska cruise. 7:53 Joining Highway I-10 - and now we feel that we are really on our way. 65.7 8:42 Just pulled into the Rest Area briefly just to see if the Indians are there selling their wares - pottery and jewelry. No one was there so we returned to the highway without stopping. 102.4 9:14 I have the downtown area of Phoenix to my right. 138.5 9:47 A sign saying we have just reached El. 2,000 feet. 156.3 10:01 El. 3,000 feet. 160.3 10:07 - 10:52 Sunset Point Rest Area. Sunset Point, El. 3,400 feet, is a beautiful Rest Area which serves both north and south routes. Here there is a very good selection of wild flowers, a lot of which are blooming at the moment. 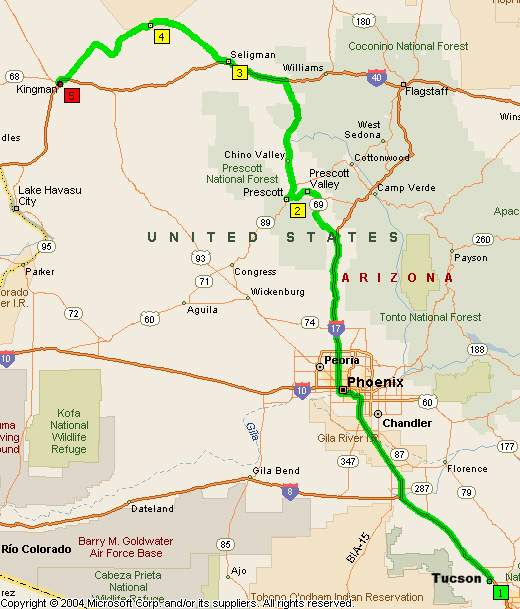 161.6 10:56 Back on the highway until we leave at Exit-262 to take AZ-69 to Prescott. 172.4 Prescott is 33 miles. 186.4 El. 4,600 feet as we enter Humboldt. 191.4 11:23 Prescott Valley, El. 5,100 feet, was founded in 1966. It is a beautiful area, a lovely valley, with lots of houses scattered throughout. There are also lots of businesses and the traffic is far busier than I expected. 201.0 11:36 It is taking longer to get to Prescott than I anticipated as we have been in a 45 mph zone for quite some distance ... but it is very attractive valley. 201.3 Prescott City Limit, Prescott, El. 5,300 feet, founded 1864. We will be leaving AZ-69 for AZ-89 north just around the corner here. AZ-89 goes up through Chino Valley to Ash Fork. 205.3 11:44 Leaving AZ-69. Just as we turn the corner we pass a huge veteran’s hospital. Ash Fork is 51 miles. 208.3 Starting to pass a small lake on the right. 209.3 Passing through a rocky area with rounded rocks similar to Texas Canyon. I am guessing that they are granite rocks because of a road called Granite Dells. 209.8 11:52 Leaving after having found a little spot where I could pull off the side of the road to take a picture. 213.5 11:57 The speed has just increased to 65 mph so that was a long distance from the time the 45 mph started through Prescott Valley and Prescott! 216.0 Antelope off to the right hand side of the road. 217.2 Chino Valley Town Limits. 219.3 12:05 - 12:12 We stopped at the Chino Valley Chamber of Commerce to ask about a park where we could have lunch. 223.3 12:20 - 12:45 Memory Park, Chino Valley, for a lunch stop. 224.3 12:50 - 1:03 Pit stop and coffee. 224.4 1:05 34 miles to Ash Fork on I-40. 228.4 1:10 Leaving Del Rio Springs Historical Marker. 238.0 1:20 We are getting very fine spitting rain as we drive north. 241.3 Crossing a canyon deep below us. The spitting rain did not last for long - just a spit, that is all, like somebody sneezed and that was the end of it!! 259.0 1:40 We have left US-89 and are on the ramp for I-40 west, which we will take until the exit for US-66 (Route 66). 264.9 1:45 Leaving the interstate at Exit-139. 265.1 1:46 Stopped for a picture after leaving the highway and now continuing. 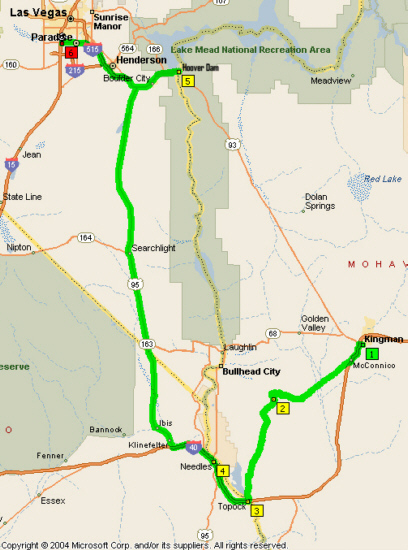 265.3 Crookton Overpass is 9 miles, Seligman 17 miles. We started to notice signs along the road, a few words on each sign and the last one was for a product being advertized. 272.8 El. 5,700 feet as we climbed up to a high point then descend a bit. Of course this is old US-66 which is exciting for both Mary and me. More signs - He tried • to cross • as fast train neared • death didn’t draft him • he volunteered • Burma Shave. 278.9 2:03 - 2:06 Stopped to watch a train go by, two locomotives in front and two in the rear, and counted the number of freight cars - 143. 279.4 2:07 A few more rain spots, a little heavier but mor spread out than the ones we had earlier. More signs - The one who drives • when he’s been drinking • depends on you • to do his thinking • Burma Shave. 282.6 2:13 Welcome to Seligman. This is really a unique town with lots of things to see and we are just stopping and starting as we go through town. 284.1 2:29 Peach Springs 35 miles. We are just at the western end of Seligman and near the junction with I-40. These signs along the road are hilarious! 309.3 2:53 - 3:13 Grand Canyon Caverns. This was an interesting stop at the caverns, even though we did not tour of the caverns themselves. The lady at the information counter told us about a museum that we were welcome to walk through. It contained a lot of old stuff which brought back some memories. As we left a few more drops of rain fell. From here Peach Springs is 10 miles, Kingman 61 miles. 320.6 3:24 The road is passing just to the south of the main part of a town, which should be Peach Springs, a town on the Hualapai Indian Reservation. We are also driving parallel with a railway line. Tumble weeds are tumblingalong. 321.4 Here is the actual sign for Peach Springs and there is a few old buildings and an old gas station that is not in operation any more. A tumble weed just tumbled under the car but it did not tumble out the other end! Splat!! 330.1 3:34 Entering Truxton. There is no speed limit here, so if you blink you might miss it. 335.4 After a long straight stretch the road is curving and is starting to descend into a valley. There are high, flat topped hills straight ahead - mesas with high rock cliffs before sloping towards the bottom. 337.0 Stopped for a picture of a mesa hill. 338.2 We took several pictures in the area here and now the hillsides are covered in rocks. 339.1 3:50 Leaving after having stopped to watch another long train go by. It could even have been the train we had seen earlier. 345.4 3:58 - 4:04 Hackberry. 369.2 4:26 Kingman city limit. 370.4 4:32 Wayfarer Inn. We stopped to confirm our reservation, then immediately left for the Visitor Center before it closed. We wanted to get information about the nextsection of the Historic Route 66 for tomorrow since we could be on the road before it opened next morning. 373.7 4:42 - 4:54 Information Center - Powerhouse Visitor Center. Just as we are about to leave the Powerhouse Visitor Center and I started the motor the gas light came on, so tomorrow we would be setting off with a full tank. 377.3 5:20 Checked in, Best Western Wayfarer Motel, Room 108. We are at the Wayfarer Inn Best Western in Kingman and we will be leaving from here to take the next section of US-66. 377.3 8:15 Leave Wayfarer Motel. 380.8 Stopped at the Powerhouse for a picture of the Route 66 mural. 380.9 8:25 Just turned off behind the powerhouse for the start of US-66, so now we are on our way. Oatman is 28 miles. 382.5 Windmills ahead of us as we wind through a canyon. 399.5 9:02 Leaving after stopping at the side of the road near a blooming ocotillo for pictures of the area. 400.6 Turning off for a kiosk with Back Country Byway information. 400.6 9:07 - 9:15 Stopped at Back Country Information board. It is becoming obvious that today’s journey is to be a slow one, a stop and go day, not because of heavy traffic but because of the scenic beauty of the area and many photographic opportunities! Also, the road is winding and narrow with numerous hairpin and “S” bends with few suitable stopping places for photography. However, since any approaching traffic is visible long before it reaches us it is possible to stop briefly and take pictures from the car! Five miles after leaving the Back Country Information kiosk and twenty-six minutes later we reached a large parking area immediately before the pass. 405.4 9:41 - 9:55 Sitgreaves Pass, El. 3,550 feet. 405.7 7:57 - 10:06 We pulled into another large parking area below the pass with views looking back to the pass. We could also see portions of the road we still had to travel. Walking around in this area we found a crude cemetery. 409.9 10:23 - 11:13 On arrival in Oatman we pulled into a parking lot at the start of the town, so we could walk down one side of the street and back the other. For the most part the town is a tourist trap, but if you can look beyond the stores and all the gimmicky stuff for sale, it is fun to see the old buildings and absorb a bit of history. As we walked back up the street word quickly spread that the wild burros were coming into town! Many people bought food to feed to them (not recommended), and while all this was going on traffic more or less came to a standstill. Early day prospectors would sometimes go weeks, and occasionally even months, without seeing another human being and a bottle of whisky was a poor substitute for taking the edge off sitting alone on a bitter cold night on the side of some mountain or in some small, chilly one-room cabin. There actually was a much better way to avoid the loneliness. Many miners and prospectors found they had a true friend they could talk to, palaver with and even complain to, as well as rely on for survival .... a friend who was so loyal and hard working, so tough and so strong, and often so reciprocal that their relationship passed the bounds of simple friendship - this friend was his burro. Miners often became so attached to their burro that they frequently shared their flapjacks and biscuits with him, and in return, it was this same loyal friend who always seemed to make sure his owner somehow made it over the next hill - from camp to camp - day to day - month in and month out. Perhaps it’s the tenacious nature of burros ... perhaps it’s their appealing and lovable nature ... perhaps it’s their strength, their loyalty or their endurance, but one thing’s for certain more heartwarming stories have emerged from the mining days in the 1800's and early 1900's that feature a burro than perhaps any other animal. Historians all agree - the burro played a varied and extremely critical role in early history, and because of its notoriety it’s no wonder he’s been called everything from a floppy and shaggy ‘ole critter with uncanny intelligence to the most lovable and loyal of pets - from cantankerous to mouthy, and oh yes, we can’t forget downright stubborn at times. Burros are extremely strong and sure footed. Carrying anything and everything of almost unbelievable weights, they were also incredibly hardy animals and can survive in sparsely grassed pastures and meadows that would not support a horse or a cow, and weather conditions that would bring other animals to their knees. We can visualize those faithful little long-eared creatures, sides heaving, as they dragged themselves up the mountain with incredibly heavy cargo hitched to their sturdy backs; the cargo included gold ore, equipment, machinery parts, long steel cable, and of course their owner. 410.1 Passing the public rest rooms which are at the other end of town from where we were parked! 411.0 Stopped to look at one of the coaches from the olden days - we have seen quite a number of them since driving out of Oatman. Ahead the road divides, one branch to Bullhead City and Laughlin, the other, Historic US-66, to Golden Shores. 412.5 11:25 Junction of the road, but we are staying on US-66. 427.3 11:48 Passing another Byway information place like the one we saw at the beginning of this trip. 431.1 Passing a missile silo. 435.0 12:01 - 12:10 Topock - snack and coffee break. A long train loaded with containers passed by whilst we were stopped here. 435.9 Starting to cross the Colorado River. 436.1 The California state line and on the other side of the bridge a Welcome to California sign. 436.9 Entering Pacific Time Zone. However, since Arizona does not observe daylight saving time the time is the same as we have. 441.7 12:19 Stopped for the California Inspection Station. 446.8 12:24 Leaving I-40 in Needles, and, although there are signs for US-95, I again had trouble, as has happened previously, I could not find this route. 451.2 I am back on I-40 again after dithering around in Needles trying to find US-95 not AZ-95! 459.6 12:49 We are now on US-95. 465.9 12:56 Stopped at a level crossing for a train to pass by. 482.8 1:13 Nevada/California State Line. Welcome to Nevada. 491.6 1:21 Cal-Nev-Ari, El. 2,550 feet. Cal-Nev-Ari is a census-designated place on U.S. Route 95 in Clark County, Nevada, United States, near the state's southernmost point. As of the 2010 census, the town had a population of 244. The town's name is a syllabic abbreviation of California, Nevada, and Arizona. Cal-Nev-Ari was created in the mid-1960s by Nancy and Slim Kidwell, who acquired a 640-acre (2.6 km2) section of land from the U. S. government and commenced development of an airport-based community. In addition to the FAA-designated Kidwell Airport, the community has grown over the years to include a casino, motel, RV and mobile home parks, convenience market, and over 100 residential lots. 500.7 Rain spots on the windshield, but Mary can count them! 503.1 1:30 Welcome to Searchlight. Here gas is $3.55 a gallon. There are quite a lot of very nice looking Joshua trees in the Searchlight area. 518.7 A sign for Boulder City, El. 2,507 feet, but we are still well away from the city itself. 529.9 More rain spots but there are too few to bother counting them. Las Vegas is 32 miles from here but before going into the city we will drive out to the Hoover Dam. 539.4 Heavier drops and the sky is darkening. 540.0 2:01 Junction with US-93, and we are 540 miles from home. 551.0 2:20 Starting to cross the Hoover Dam and we will drive to the uppermost overlook where, since the building of the bridge over Black Canyon and the rerouting of US-93, the road now dead-ends. 552.5 2:35 - 3:05 End of the road at the uppermost overlook. Here we had a very heavy shower of rain, so sat in the car to eat our lunch. 553.1 3:15 Leaving Lake Mead and bridge overlook. 555.6 3:27 - 3:35 Lake View Overlook. 558.9 3:43 - 3:53 Alan Bible Visitor Center. 561.4 Sprinkling rain as we enter Boulder City. 566.0 4:07 The junction with US-95 south to Needles and here we continue straight ahead to go into Las Vegas. 591.5 4:39 At the moment I am driving around trying to find where we can park for going into Excalibur. 591.6 4:44 Arrive Valet Service for Excalibur, Las Vegas. The attendants here were very helpful, unloaded our car onto a trolley, parked the car and showed us where to go. Excalibur is a huge complex and it took a while before were settled in our room. I was able to bring my cooler in and we had our supper before venturing out for a walk along The Strip. I had hoped to go as far as the Bellagio to show Mary the Dale Chihuly ceiling, but decide against going so far as we still had to return to Excalibur!! This morning we will be leaving Las Vegas and heading towards Death Valley and beyond. 592.0 8:45 Leaving from Excalibur. 598.5 9:12 Junction with I-15 which is stop and go traffic. This was after driving through the Bellagio, then going around in a circle trying to find an entrance onto the highway and doing a behind the scene stuff. 602.5 9:27 Leaving I-15 for US-95 north. 640.9 10:00 That was quite a headache getting away from the Las Vegas strip but we made it! Once on the freeway it was very slow going because there had been quite a bad accident on the road ahead. The 6 lanes of traffic had to merge into 2 lanes! 647.0 10:06 Indian Springs, El. 3,123 feet. 647.3 10:07 - 10:13 Indian Springs. Upon checking the map I realize that I have made an error, and should have been heading out of Las Vegas on NV-160, through Red Rock Canyon National Conservation Area, to Pahrump. All is not lost, however, and instead of turning around I can continue on US-95 then turn south on NV-373 through Amargosa Valley to Pahrump - a roundabout way of getting there! 650.7 Cactus Springs, El. 3,230 feet - but blink and you have gone passed it. 674.4 10:36 Turned off on NV-160 and Pahrump is 27 miles. 692.0 10:52 Starting enter the town of Pahrump and am approaching the road to Death Valley, the one I have taken previously. 698.1 10:58 Passing the turnoff for Death Valley National Park and Ash Meadows Wildlife Refuge. Pahrump is very spread out because we have not yet come into the downtown area with which I am more familiar. 700.4 Pahrump, El. 2,695 feet. 702.4 11:24 At a traffic light and turning off for NV-372 to Shoshone, which is 28 miles. 710.3 11:36 Leaving after stopping for a number of pictures at the Nevada/California State Line. Here the highway becomes CA-178 and Shoshone is 19 miles and the boundary of Death Valley National Park is 97 miles. 729.5 After coming over the mountain range and descending to the bottom of the valley, there is water lying at the side of the road. 730.0 Driving through Shoshone. 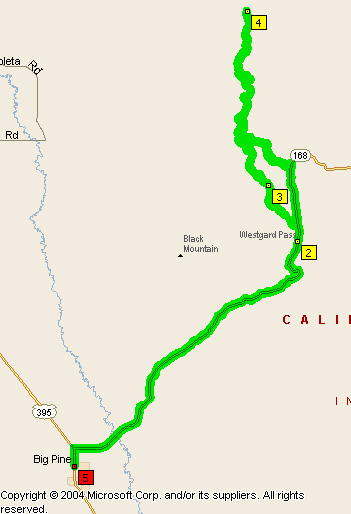 Here, briefly, before turning to continue on CA-178 to Badwater, we are on CA-127. After turning the corner there are hills of lava and just outside of Shoshone the valley appears to be very damp because there are lots of bulrushes. 731.1 12:01 Warning sign - Next service 72 miles. Badwater is 55 miles and the Visitor Center 72 miles. 734.2 Sign - El. 2,000 feet. That would indicate that we will be continuing to climb. 735.8 12:07 Leaving after stopping for a picture of the beautiful sign for Death Valley National Park. 742.6 12:15 Summit - Salsbury Pass, El. 3,315 feet. 742.8 Long downhill 8 miles. 746.7 A sign for the end of CA-178 as the road enters Death Valley National Park. 749.8 Bright red rock showing on the hillside. 752.5 12:32 Jubilee Pass, El. 1,093 feet. 756.5 It is very sandy through this area but we are still descending to the valley and have not reached the bottom yet. 759.3 Near the turnoff to some ruins - fantastic colors in the hillside to the right. The hills to the right come down and then at the end of them there is all the what looks like volcanic lava and in between the arms are washes coming down from the mountains which are very sandy. 766.5 There is water lying on the ground I the valley to the left and we are right at the foot of the mountain range here. 770.5 A picture along the road from Mormon Point looking towards a red mountain with a big light colored patch on it and white salt (?) lakes in the valley. There is also some water lying in the bottom of the valley. 777.2 We have turned away from the mountain and are a little lower down in the valley with the water to our left. The mountain range has such a variety of colors in it that one could taking picture every few feet. 778.9 Back at the foot of the mountain. The road winds a lot over undulating country but keeps turning and running into the mountain. Then, at the last minute, it does a left turn and takes you away from the mountain and repeats this pattern a number of times. 785.3 The road appears to be going straight into the mountain again! 786.9 1:29 - 2:12 Badwater - 282 feet below sea level. 789.8 Telescope Peak, El. 11,049 feet is out to the left. 790.5 Passing the turnoff for Natural Bridge which would be an archway in the mountain side. 803.6 Junction of Badwater Road with CA-190. Nearby is the Historic Inn at Furnace Creek, originally opened in 1927 but with the addition of more rooms, not completed until 1935. Here, also, was a marker showing that we were at Sea level, as well as a monument to the 49ers. The Death Valley '49ers were a group of pioneers from the Eastern United States that endured a long and difficult journey during the late 1840s California Gold Rush. 805.4 2:44 - 3:15 Furnace Creek Visitor Center, which is 190 feet below sea level. 820.0 100 feet below sea level. 828.9 The parking area for the sand dunes. 830.2 There is water lying along the roadside and where cars have pulled off to the left they have been in mud! 830.5 Just entering Stovepipe Wells, El. 5 feet. 840.1 Passing the turnoff for Emigrant Canyon Road to Wildrose camping area and the Charcoal Kilns. There is a toilet under a tree here and a picnic table. 840.3 3:48 52 miles to Lone Pine. 844.5 Lots of evidence of volcanic action. 845.0 El. 4,000 feet. There is all sorts of black lava showing amongst the grasses and shrubs that are growing here. We are getting some light spots of rain and actually we could even get a heavy shower as there are some dark clouds around. 848.0 3:57 Pulling into a brake check area and this is right by the sign for Town Pass, El. 4,956 feet, so we are only 43 feet short of 5,000 feet elevation! 848.6 Downhill for the next 9 miles, with 9% grade for 6 miles. 870.1 El. 4,000 feet and I am going to turn into Vista Point. 870.2 4:30 Vista Point - Padre Crowley Point. 870.6 I was going to drive out to the point but turned around when the dirt road became very rough. 870.9 4:42 Leaving Vista Point. 874.8 We are starting to see a few Joshua trees. 875.8 4:51 Leaving Death Valley National Park. 876.6 More rain spots. We can see the rain and dark clouds all around us but it has not interfered in any way with our day. It was 92° at the visitors center. 887.1 We are seeing lots of snow-covered mountains to the right of the road. 894.1 5:09 CA-190 makes a sharp turn to the southwest and the road straight ahead, which I am taking, becomes CA-136. Lone Pine is 19 miles. 900.0 5:15 We are passing through a very sandy area at the foot of the mountains at present and the flat valley to the left has water in it and salt or alkali. There is a lot of snow on the Sierra Nevada Mountains to the left, and this is in the vicinity of Mount Whitney, the highest summit in the contiguous United States, with an elevation of 14,505 feet. If one was a crow it is less than a hundred miles between the lowest and highest points in the lower 48 states. 912.0 5:27 CA-136 ends at the junction with US-395. 5:31 Arrive Best Western Plus Frontier Motel (57°F). 913.1 5:38 Room 134 - Parked for the night. We walked around the motel grounds to take pictures of the area. Leaving from Lone Pine in California we will be heading north today. First thing this morning when the sun was shining on the Alabama Hills they were a bright gold color. 913.1 7:55 Leaving the motel to drive north. 913.6 Entering Lone Pine, pop. 2,060 El. 3.700 feet. Driving through Lone Pine I noticed a road named Whitney Portal and decided to turn off and investigate. 914.1 8:00 Turning onto Whitney Portal. 915.0 Alabama Hills Recreation Area a lovely sign. There are two main types of rock exposed at Alabama Hills. One is an orange, drab weathered metamorphosed volcanic rock that is 150-200 million years old. The other type of rock exposed here is 82-85 million year old biotite monzogranite which weathers to potato-shaped large boulders, many of which stand on end due to spheroidal weathering acting on many nearly vertical joints in the rock. 917.0 The road is going down into a valley on the other side of heap of rocks which when the sun was on it first thing this morning were bright gold color. 920.7 Sign: Entering active bear area. 922.7 Starting to climb into the mountainside. The road was steep and winding and occasionally and whilst climbing there were some rocks across the road which had fallen during the night . There was a sign saying: Snow and rock clearing are done between 8 A.M. and 4 P.M.
926.4 8:33 We drove past the Whitney Portal Store, which is located next to the Mount Whitney Trail, then followed a one-way loop around a small pond before starting the return drive to Lone Pine. The Mount Whitney Trail is a trail that climbs Mount Whitney. It starts at Whitney Portal, 13 miles (21 km) west of the town of Lone Pine, California. 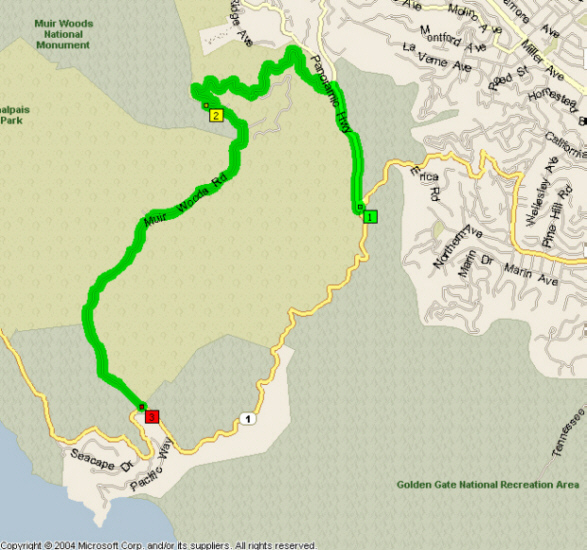 The hike is about 22 mi (35 km) round trip, with an elevation gain of over 6,100 feet (1,860 m). It is an extremely popular trail, and its access is restricted by quotas from May to October. As we were coming down there was a grader going up clearing the rocks off the road. 938.7 9:13 Back at US-395. On returning to Lone Pine I thought that before going north it would be a good idea to drive south to the Eastern Sierra Interagency Visitor Center, located at the junction of CA-136 with US-395. I had been to this Visitor center previously and I wanted Mary to see it and get a better idea of where we had been. It was 46° when we got up this morning and now as we pass the motel the thermometer is showing 63°. 940.7 9:17 - 9:43 Eastern Sierra Interagency Visitor Center. Mount Whitney, the highest peak in the “lower 48 states” can be viewed on a clear day from this center, but unfortunately today the clouds are hanging over the upper elevations. 941.7 9:46 As we pass the Best Western the temperature now is 59° - it was 60° a moment ago! Now we really are going north, that is until the next detour! The elevation of Lone Pine is 2,600 feet and our big climb this morning to Whitney Portal took us to an elevation of 8,300 feet. 955.0 Another sprinkling of rain! 958.3 10:04 Entering Independence, El. 3,925 feet. 972.1 Crossing a lava field - strange, weird lava flows all over the land. 984.9 10:29 Entering Big Pine, pop. 1,350, El. 4,000 feet. 986.3 10:40 Turning off for the Bristlecone Pine Forest. A sign at the side of the road indicates that it is 24 miles. Also snow is not removed from 8 P.M. to 4 A.M.
993.3 10:53 Leaving from taking a picture looking towards the Sierra Nevada Mountains. 996.5 The road is passing through a very rocky canyon. Up until now we were winding around in between hills, but now we have rock walls on either side! Here, also, the road becomes a single lane! 996.9 Back on a two-lane road. Just at the point when I said we were going through a canyon that section of road became a single lane. 999.4 11:07 Turning off for Bristlecone Pine Forest. 999.9 11:08 Stopped at the entry, Schulman Grove is 10 miles ahead. 1,004.9 There is little patches of snow lying around on the ground between the trees. 1,006.8 11:25 El. 9,000 feet. 1,007.5 We are in amongst the snow now with snow along the road as well. 1,010.0 11:37 - 12:10 Schulman Grove, El. 10,105 feet, 2,000 feet higher than we were earlier this morning! There was so much snow on the ground that we were unable to take the short, Discovery Trail through the nearby ancient bristlecone trees. Before leaving Schulman Grove we decided to have our lunch - lunch on top of the world! 1,012.6 12:21 - 12:39 Sierra View Vista Point. It was bitterly cold, but Mary did hike the short loop. 1,020.6 12:57 Junction with CA-168 and now Big Pine is 13 miles. US-95 is 70 miles to the east of here. 1,021.6 8% downgrade for 8 miles. 1,023.1 Start of the 1 lane road and the canyon. 1,023.7 End of the rocky canyon. 1,025.5 Back to El. 6,000 feet. 1,031.3 Passing the turnoff for Saline Valley and Scotties Castle. This is the route LP, my husband, and I tried to take to Death Valley in 2009. 17 miles along the road we met up with a Ranger who recommended that without a four-wheel drive vehicle we should not continue! 1,033.8 1:21 Back at US-395 and turning north. 1,039.8 El. 4,000 feet on US-395. 1,048.1 Entering Bishop, El. 4,140 feet, pop. over 3,000. 1,063.4 1:53 El. 5,000 feet. 1,064.0 There are black clouds out to the right and I think it must be pouring out there. 1,066.9 1:56 Pulling into a scenic area. 1,071.3 Sherman Summit, El. 7,000 feet. 1,077.8 2:07 Pulled into a scenic lookout overlooking Mono Lake, but decided there was nothing here for us to stop, so we are continuing on. 1,088.3 2:17 Leaving US-395 for the exit to Mammoth Lakes. 1,089.7 2:19 Mammoth Lakes Town Limit, pop. 7,093, El. 7,554 feet. 1,091.2 2:23 - 2:37 Mammoth Lakes Visitor center. 1,093.8 We are getting a little bit of rain. 1,096.8 2:50 Turned around at the end of the road to go back into Mammoth. Minaret Road which goes out The road to the Devil’s Postpile National Monument is closed. I was looking forward to showing Mary this special place, as well as the wonderful views of The Minarets. The Minarets are a series of jagged peaks located in the Ritter Range, a sub-range of the Sierra Nevada Mountains in the state of California. They are easily viewed from Minaret Summit, which is accessible by auto. The peaks bear a certain resemblance to the minarets of Islamic mosques. Collectively, they form an arête, and are a prominent feature in the Ansel Adams Wilderness which was known as the Minaret Wilderness until it was renamed in honor of Ansel Adams in 1984. The peaks were named in 1868 by the California Geographical Survey, which reported: "To the south of Mount Ritter are some grand pinnacles of granite, very lofty and apparently inaccessible, to which we gave the name of 'the Minarets.'" Seventeen of the Minarets have been given unofficial names, including Michael Minaret, Adams Minaret, Leonard Minaret, and Clyde Minaret. Clyde Minaret, named after Norman Clyde, is the tallest of the spires. The Southeast Face Route of Clyde Minaret is a technical rock climb featured in Fifty Classic Climbs of North America. 1,097.5 2:54 Leaving after pictures of the ski slope. 1,101.1 3:01 Back in the town and turning onto Lake Mary Road, and it is raining again! 1,103.4 3:06 - 3:12 Twin Lakes. 1,105.5 Lake Mary, El. 8,910 feet I just took a picture of the sign. 1,107.5 3:34 Turning back after doing the Mary Lake loop which winds through magnificent forest. It is 3½ miles back into Mammoth and from there 3 miles back to US-395. 1,108.9 3:37 - 3:38 Back at Twin Lakes where we have stopped to take off our coats before heading out to the highway. 1,115.0 3:49 Back at US-395. 1,122.3 3:57 - 3:59 Pulled into a Rest Area to look at the map. 1,126.2 Dead Man’s Summit, El. 8,036 feet. 1,135.0 El. 7,000 feet and currently we are driving across fairly flat country. Sign: CA-120, the road over Tioga Pass to Yosemite, is closed. 1,140.7 4:17 Passing the turnoff for CA-120 to Yosemite. 1,141.2 Entering Lee Vining, El. 6,781 feet. This looks out over Mono Lake. 1,150.1 El. 7,000 feet is at the bottom of a rise! 1,153.8 Conway Summit, El. 8,138 feet. 1,165.5 A heavy shower of rain. 1,166.3 Welcome to Bridgeport, El. 6,465 feet. 4:50 Stopped at a motel in Bridgeport, El. 7,519 feet, but we decided we should do a few more miles before calling it a day. 1,179.5 5:05 Devils Gate Summit, El. 7,519 feet. 1,184.7 El. 7,000 feet. This is just before the turnoff for CA-108 west to Sonora. 1,185.1 Passing the exit for CA-108. Walker is now 14 miles and Coleville 18 miles. 1,193.3 Entering a very rocky canyon and just at that point there was a big rock fall. 1,195.8 The canyon is not quite as narrow now but we still have the Walker River flowing at the side of us. 1,198.7 5:29 Entering Walker, El. 5,400 feet. We are looking for a motel here. 1,198.9 5:32 Back at another motel, Sierra Retreat, which has a Coleville address! Went to the store for some milk which we would be needing for breakfast next morning. 1,199.2 5:46 Sierra Retreat - Cabin 4 - end of the day. You could hardly call this a luxury cabin, but it did have a kitchen, something we always appreciate since we carry our own supplies for meals. 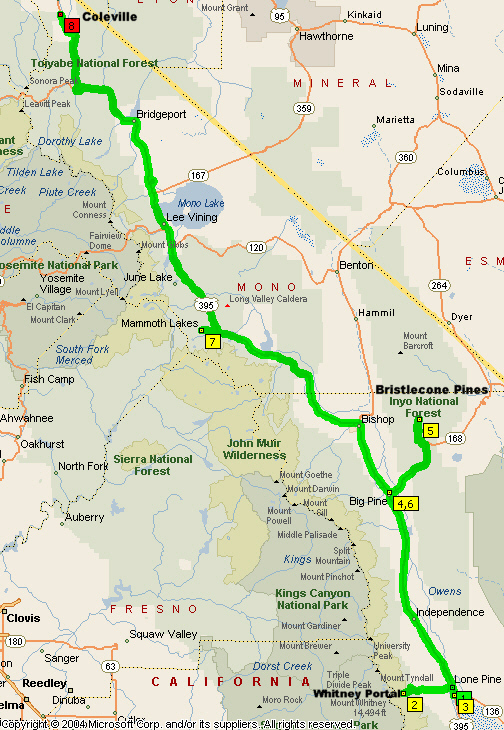 Today we will be leaving the motel here in Coleville and continuing north on US-395 to the junction with US-50. I am excited about driving US-50 into Sacramento, this being the last section of this particular highway I have to travel in order to complete the entire route from Ocean City, Maryland to Sacramento. In April, 1992, when Michael and I first saw the banner displayed across the start of the highway in Ocean City, US-50 to Sacramento 3,073 miles, we commented to each other, “Wouldn’t it be great to do that!” I have driven various sections over the years and today that goal will be accomplished. 1,199.2 8:25 Leaving Sierra Retreat. 1,208.0 Driving through the little town of Topaz the road is lined with huge cottonwood trees, something we have not seen. There are granite cliffs to our left and a lovely green valley to the right. 1,210.9 The valley is very green and as we go around this corner there is the start of a lake which extends to the north end of the valley. 1,211.1 A picture looking Topaz Lake. 1,213.3  The California/Nevada State Line. Just as I was approaching the state line a rabbit ran across the road from right to left right across the actual line! 1,214.3 Carson City 37 miles. This is the first sign we have seen on the whole trip for Carson City. However we are not going all the way into Carson City because we will be turning onto US-50 before we get there. Topaz is on both sides of the border, We noticed a Best Western motel but it looked as if it was built on the side of a hill. There is also a chain up area here which means that in bad weather trucks need to install their chains. 1,217.7 Another chain up area. 1,21.4 Stopped for the Double Springs Historical Marker. Earlier I was trying to decide whether or not the trees on the hillsides were junipers or pines. Since the Historical Marker mentions the harvesting of pine nuts I am going to assume the trees are pines. 8:57 Simee Dimeh Summit, El. 5,987 feet - the last Pass on US-395 before exiting the mountains. The following URL describes the various summits crossed whilst traveling om US-395. 1,223.7 Evidence of a fire through here to the right of the road. 1,228.5 Over a rise and looking ahead to another very green valley - Carson valley. There are trees and the signs of a road climbing up a mountainside. 1,230.6 Passing a road called Stones Throw Road! The road is now more or less at the bottom of the descent and is crossing the valley. 1,232.7 It is 61° here in Gardnerville, a very nice town in Carson Valley, a lovely valley with a backdrop of snow capped of the Sierra Nevada Mountains. 1,238.1 11 miles to the junction with US-50 and that is where we will be leaving US-395 and turning west there for Sacramento. 1,240.4 Hawk on a post. It is glorious day with a clear blue sky, maybe one little cloud peaking up over the mountains. Sign: Chains or snow tires required if light is flashing. 1,243.2 Crossing the Carson River. 1,248.0 9:42 Sign: Welcome to Carson City. We are on the southern edge of Carson City, but before we get into the downtown area, we will be turning off. 1,248.5 Stoplight on US-395 at the junction with US-50. 9:44 Turned off and now we are on our way, the last section of US-50 into Sacramento, which is 126 miles - about 2 hours were we on a regular straight road. However, this is probably a scenic route and I’m sure it won’t be a non-stop drive! 1,249.6 El. 5,000 feet. The road at present is 2 lanes each way with a solid New Jersey barrier down the middle. 1,257.9 Spooner Summit, 7,146 feet. 1,258.5 Lake Tahoe Nevada State Park. We got a brief glimpse of a lake as we rounded the corner where there was also a road going to the north end of Lake Tahoe. We are staying with US-50 and will go south of the lake. 1,259.0 El. 7,000 feet. 115 miles to Sacramento. 1,259.5 9:59 I stopped at a pullover for Mary to take a picture and for me to have a sip of coffee - very important to have my morning coffee!! 1,262.5 10:04 - 10:07 Stopped at a viewpoint. 1,265.0 I went through a small tunnel. There are two separate tunnels, one for the traffic in each direction. 1,268.0 10:16 Turned off for Lake Shore Drive, just to have a look and maybe get some pictures down along the waterfront. There are trees with blossom on them and forsythia is in flower, so it is springtime at this elevation. 1,268.6 10:20 Back on the highway. 1,269.8 10:23 Turning off the go down to the beach again but the place is closed for the season. In other words things have not opened yet for the summer. 1,270.9 10:28 Back on US-50 after unsuccessfully trying to get near the lake. Maybe we should just give up! 1,272.8 We are entering an area of huge casinos, great high buildings - Harrah’s, Harvey’s. 1,272.9 10:30 South Lake Tahoe City Limit, El. 6,252 feet. There is also a traffic light here for the Nevada/California State Line, and all the casinos are on the Nevada side. 1,275.2 10:35 Turning off on Lake View Avenue. 1,275.4 Turned around after pulling into a park but found there was no parking. 1,275.7 10:39 - 11:00 We found a spot at Regan Beach where we can park near the water. This was a beautiful and very peaceful area where we even found clean washrooms, - a good find at this point in time! Spring flowers were blooming, lovely tulips, daffodils, grape hyacinths, and, of course, the weeds - dandelions. Leaving Reagan Beach we are driving through street after street with lots and lots of houses trying to find our way out of this residential area. The whole area is full of beautiful tall straight pine trees. 1,277.0 11:05 Back at the main road US-50. 1,279.4 11:12 US-50 is making right angle turn to the left, so this is probably where we leave the lake and continue through the forest until descending from the mountains. 1,280.0 11:14 Right lane ends but there is a lovely bicycle path to the right side of the road; up until now we have had two lanes each way. Sacramento is 98 miles. 1,283.7 Meyers, El. 6380 feet. 1,285.9 We are right against the mountain side now with huge granite boulders and cliffs to our right. 1,288.6 Echo Summit, El. 7,377 feet. 1,290.9 We are down to El. 7,000 feet. 1,301.8 6% downgrade for 4 miles. 1,302.8 El. 5,000 feet. Obviously we are descending from the mountains and will not be climbing to any great heights in the near future! 1,306.6 Placerville is 31 miles ahead and Sacramento 73 miles. 1,309.6 We have a rushing mountain stream to the left of the road now. 1,311.0 Crossing the South Fork of the American River. 1,311.8 A 4-lane highway is just 4 miles ahead. 1,314.0 Passing through an area which shows evidence of bush fires, but a long time ago I would think. 1,315.7 12:06 - 12:56 We have stopped to have lunch before getting onto the 4-lane highway. Beside the road there is a rushing stream with a sandy shoreline on one side and beautiful trees in the forest on the other. However, there was not a single tree providing us shade for lunch! We spent quite a lot of time here because it is such a lovely spot and we enjoyed walking along the stream in both directions. 1,316.5 Junction with the 4-lane highway. 1,317.5 Sign: Chains required 12 miles ahead. I was thinking we would not be going over any more high points. 1,320.2 Placerville 17 miles, Sacramento 59 miles. 1,232.3 1:06 Beginning of the freeway. 1,327.5 We are still coming out of the mountains but if it was not for the smog ahead you would be able to see the flat country beyond the mountain range. 1,335.2 Placerville City Limit, El. 1,860 feet. 1,365.5 Rancho Cordova, El. 76 feet. 1,374.0 1:55 Entering Sacramento, El. 25 feet. 1,381 2:03 Leaving US-50 for I-5 north. 1,383.5 2:06 Exit-520 off I-5 at Richards Boulevard. 1,383.8 2:08 Arrive Days Inn, Sacramento, and we were allocated a room right away even though it was early afternoon. 1,383.8 2:15 Parked, Room 114. After unpacking our things we decided to spend some time in the old historic part of the city as well as possibly visiting the State Capitol. 1,385.4 2:45 Old Sacramento. The following pictures are a sampling of what we saw as we spent time wandering around. 1,387.6 Parked a couple of blocks from the State Capitol and we just had time for a quick visit. The California grizzly bear (Ursus californicus) was designated as the official state animal of California in 1953 (more than 30 years after the last one was killed). Before the grizzly bear was exterminated in California, this magnificent animal thrived in the great valleys and low mountains of the state (probably in greater numbers than anywhere else in North America). "The last one was killed in Tulare County in 1922, more than 20 years before the authority to regulate the taking of fish and wildlife was delegated to the California Fish and Game Commission by the State Legislature." - quote from California State Library. The grizzly bear is also honored on the California state flag. The California grizzly (Ursus arctos californicus) is an extinct subspecies of the grizzly, the very large North American brown bear. "Grizzly" refers to the golden and grey tips of its hair. Genetically, North American grizzlies are closely related; in size and coloring, the California grizzly was much like the grizzly of the southern coast of Alaska. In California, it was particularly admired for its beauty, size, and strength. Many accounts from pioneers describe grizzlies in long, bloody fights with angry longhorn bulls, and often winning. Early on, the grizzly became a symbol of the State, was the basis of the state flag, and historically, California was known as the "Bear State." California still has habitat for about 500 grizzlies and if the North Cascade population recovers and expands, eventually the grizzly will likely return to California. There are however only about 20 of these bears remaining in that ecosystem. We are leaving from the Days Inn in Sacramento to head out to the California coast. It is a beautiful sunny day and the temperature is 61°, but is suppose to get up to 92°. Our travel plans are to take I-5 south to US-50/Bus I-80, then west to I-80. 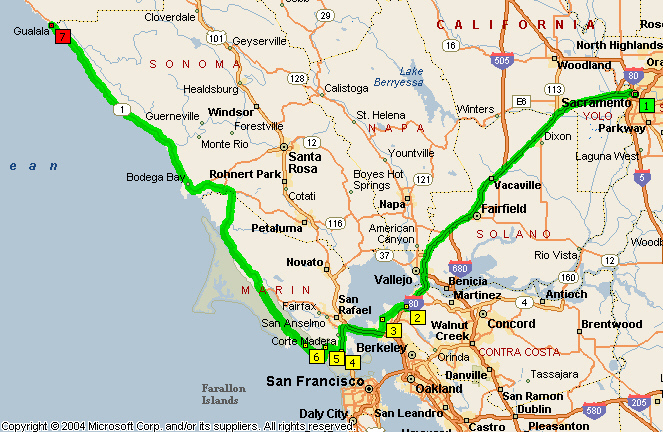 From there we want to take Exit 23 for Tara Hills/Richmond, then I-580 to San Rafael and US-101 to CA-1! Getting out of Sacramento was a bit hairy, but we did manage to find all the right roads we needed to be on, and currently we are on I-80 heading towards San Francisco and looking for Exit 23. 1,415.1 9:24 We have an almond orchard on our right. 1,417.9 Passing an orchard which has grape vines along the fence or boundary. 1,427.0 We are going back into the hills now. 1,451.8 9:58 Start of a bridge over a waterway, the Carquinez Strait which connects Suisun Bay to San Pablo Bay, each bay being the tidal estuary of the Sacramento and San Joaquin Rivers. 1,546.1 10:02 Leaving I-80 at Exit-23. 1,465.0 We are driving through an industrial area, an oil refinery with lots of tanks, and which looks to be on both sides of the road. 1,467.9 10:42 On I-580 west. 1,468.7 10:43 Stopped to pay the $5.00 toll for crossing the 5.5 mile long Richmond-San Rafael Bridge (officially the John F. McCarthy Memorial Bridge) which opened in 1956. After crossing the bridge I-580 ends at the junction with US-101, which we took south towards San Francisco. 1,480.3 10:59 Leaving US-101 for CA-1 north. 1,482.5 There are lots of houses all through here but we are out of the main residential area and into tall Eucalyptus trees. The smell is just wonderful! We have turned off on Panorama Highway to go to Muir Woods National Monument which is 3 miles. We probably wont go into the park because we will be seeing lots of the redwoods further north, but it would be nice to drive up this road, turn around and come back down to CA-1. 1,485.4 11:21 Pictures of the road with its 10 mph hairpin bends. After turning off Panoramic Highway we had a steep and winding descent to the entrance of the Monument. 1,486.0 11:26 We turned around at the entrance to Muir Woods. It was a crazy Saturday with crowds of people milling around and more tourist bus loads arriving. The route back to CA-1 was not the way we had come - it was longer but less winding. 1,489.6 11:38 - 11:51 Muir Beach Overlook. There was no point in our taking the trail to the overlook of the coast as it was engulfed in fog. However, we did go by the gun battery completed in 1897 and used until 1943. 1,495.4 12:09 - 12:15 Stinson Beach. 1,496.8 We are driving along a waterway which I suspect is a tidal river. 1,498.5 A lot of people fishing or least a few people with a lot of fishing rods. 1,499.2 12:25 Although the sun is starting to shine and we have blue sky there is still fog coming in off the ocean. We have stopped momentarily alongside this river which could just be an inlet from the ocean! 1,500.7 Pictures of gum trees on either side of the road and the smell is wonderful. We are also seeing a lot of very tall cypress trees. 1,501.3 A sign for Point Reyes National Seashore, but we will not be going to do today. 1,501.9 Back into the gum trees again not only are the gum trees tall but they are also very big trunks. We could almost be driving along the Great Ocean Road through the Otway Ranges in Victoria, Australia! We have also passed cyclists riding in both directions. There are parts of this road where we are going under a canopy of trees and this is happening quite frequently. 1,508.2 Eschscholtzia (California poppies) growing on the embankment to the right of the road. 1,510.5 We have passed the turnoff for the lighthouse at Point Reyes. Everywhere there are lots of Eschscholtzia. 1,511.7 12:52 - 1:04 Point Reyes Station where we stopped at the bakery to buy some sandwiches. 1,518.6 1:19 - 1:34 Stopped to eat our sandwiches. 1,521.0 There are many fishing places along the foreshore here, also a store selling crab and oysters. There are a lot of picnic areas at the side and all look to be pretty full with people and there are cars parked all along the side of the road. Actually it is a beautiful area but looksrather hectic, probably because this is Saturday. 1,522.3 Going through a cypress grove. 1,522.5 Big eucalyptus trees with blossom on them. 1,525.5 Some deer just over the fence at the side of the road. 1,526.7 The road continues passing through groves of either gum trees or cypress trees and they are very big. Also at this point we are leaving the coast and going inland for short time and will return to the coast at Bodega Bay. Lots of gauze is in flower. 1,528.8 1:59 Entering Tomales, pop. 550, El. 43 feet. 1,530.3 Away from the coast the grassy hillsides are green and cattle are grazing. 1,531.2 Passing a big diary farm. 1,533.9 A flock of sheep. 1,534.3 2:08 Junction with Valley Ford Road coming from Petaluma which is the Napa Valley area. There are diary farms all through here. 1,536.0 2:11 - 2:17 Valley Ford. We stopped and bought some fresh farm cherries - $8.00. What a treat! 1,537.8 There is still fog in the valley out towards the coast. 1,543.0 Entering Bodega Bay. I have pulled off the road to go into the beach and am backtracking a little. 1,546.8 2:30 - 2:35 Stopped as I am going to turnaround for some pictures of the blue spiky flowers. 1,544.3 2:38 Back at the highway. 1,548.8 2:51 Leaving after stopping briefly to check the map. There are some lovely wild irises growing among the grasses. 1,553.0 A wall of lupin as we come round a bend, that is a steep embankment covered in lupin. 1,554.8 3:07 - 3:11 Stopped for a picture. There was also a man selling smoked salmon, but very expensive! 1,555.1 3:13 The bridge is crossing Russian River. 1,556.4 Entering Jenner and now fog is blocking our view. 1,557.6 Fort Ross is 11 miles, Sea Ranch 27 miles. 1,561.5 We have been driving in and out of fog most of the day, although not as thick as it is getting now. However, visibility is still reasonable. 1,564.0 A wall of poppies. High up on the hillside we seem to be above the fog now and have blue sky and sunshine. 1,567.0 Traffic light for a single lane road. 1,568.5 3:42 Fort Brag is still 86 miles, so I doubt that we will get that far today! 1,573.7 Quite a heavily wooded area and we are driving under a canopy of trees again. 1,577.4 There is evidence here that a fire has been through this particular area of woods. 1,578.5 Point Arena 30 miles. I would like to see the Point Arena lighthouse. 1,586.2 A deer just ran across the road. 1,592.7 Another deer crossing the road. 1,593.9 4:22 Crossing the Gualala River and entering Mendocino County. 1,598.6 We are driving through a forest and the trees look like redwoods to me. 1,609.0 4:45 Point Arena. This looks to be a pretty dead sort of town and not very impressive at all. We can’t see anywhere to stay so are going on towards Manchester which is 4 miles further along the road. There was no sign for the Point Arena lighthouse - just nothing. 1,611.4 4:53 - 5:12 Stopped at the turnoff for the lighthouse at Lighthouse Point Resort where we thought that we were hopeful of getting accommodation. The resort turned out to be a GEVC (Global Exchange Vacation Club) timeshare! However, the lady in the office very kindly phoned back to Gualala and we now have a reservation being held with my credit card at the Gualala Country Inn. This is 14 miles back but at least we now have a room tonight. 1,628.3 5:36 Gualala Country Inn, a lovely place to stay. 5:54 Sunset Room, which was very comfortable. After unpacking the car we were ready to have our supper and after this I thought that I should capture a picture of the sunset. In the evening we went to the lounge area and played Quiddler. We sat at the table by a window, looking out on the ocean and this was so much nicer than staying in our room. 1,632.5 9:02 Anchor Bay Campground in amongst the redwoods. 1,638.5 We have lost our lovely blue sky and are running into some fog. 1,642.0 Now we are actually driving in the fog. 1,642.9 9:18 Entering Point Arena for the second time. 1,645.1 9:22 Turning off the highway onto Lighthouse Road. 1,647.4 There was a closed gate at the end of the road and the fog was so thick we couldn’t even see the lighthouse! There was nothing else for it but to return to the highway and go on our way! 1,647.8 The sun is trying to push through the fog and I tried to take pictures of the beautiful Indian paintbrush and wild iris growing alongside the road. 1,649.7 Back at Lighthouse Point Resort and Mary has just gone to thank the lady for phoning sending us back to the Gualala Country Inn last night. 1,649.8 9:40 Back on the main highway, CA-1, and now we are on new road. 1,651.4 Crossing the Garcia River. 1,652.2 Cypress on one side of the road covering almost the entire road. 1,653.4 9:46 - 9:48 Stopped by a fire hall in Manchester to look at a very interesting hedge. It has been clipped in such a way that it looks to have legs plus it has a higher piece at one end. I am trying to think of the word I want to use to describe it and I cannot. Mary is suggesting that it is like a caterpillar. 1,657.5 Back away from the ocean front we appear to be driving through farming country and what looks like a lot of diary farms. Then, just as we come into Irish Beach, a very nice community with lovely homes, there are forget-me-nots are in flower at the side of the road, also arum lilies. 1,657.8 9:56 Pulled off for vista point. 1,658.6 9:59 As we came back onto the highway yellow lupin are growing at the side road. 1,659.2 Lot of poppies growing beside the road and after that a couple of houses with beautiful gardens and a rainbow of colored flowers along the fence line. Although we are driving in sunshine at present there is still some fog over the ocean as well as some cloud up on top of the hills to our right. 1,664.1 10:08 A sign at the side of the road informed us that we were entering a tsunami hazard zone, followed soon after by another sign that we were leaving the tsunami area. The tsunami zone was just in a very low section where the road dips into a beautiful inlet, I would love to have some pictures here but there was absolutely nowhere to stop. 1,665.1 We are seeing a lot of rhododendrons in flower and the lady at the inn did say a rhododendron festival was going on somewhere. Lots of yellow lupin on the embankment as we approach a one-lane bridge. 1,666.4 10:13 Stopped for the one-lane bridge and the light has just changed to green. 1,666.7 End of the bridge, which is curved and very high, almost at the tree tops of the valley below. Immediately over the bridge we enter the little town of Elk, quite an attractive town, but we can’t see any inns or motels. The drive this morning is really a very pleasant and we are enjoying just meandering along, getting coastal views every now and again and sometimes going up into the hills, just delightful. 1,669.2 10:20 Stopped at a pull off for views of the winding road which reminded me of parts of the Great Ocean Road in Victoria, Australia. Lots of arum lilies, wild mustard, Indian paintbrush, lupin, all kinds of flowers growing wild, then peoples houses with lovely gardens as well. Another one-lane road ahead. 1,670.2 10:24 Stopped for a red light, but not a bridge this time. It looks more like there has been a washout. 1,673.2 Entering another tsunami hazard zone, then crossing the Navarro River. 1,676.0 10:36 Stopped again for another one-lane bridge. 1,676.7 10:41 Entering Albion, El. 174 feet. 1,676.9 Crossing the Albion River 174 feet below us and looking one way up the valley there is a campground whilst the open ocean is visible in the other direction. 1,677.3 Sign for a lama ranch but I cannot see any lamas. There is an inn here, Albion Inn, with lovely cottages. I am thinking that one could stay here but it would be a bit risky coming without a reservation! 1,678.2 10:44 At the end of a hairpin bend and have just passed a lot of lovely rhododendrons growing on the cliff to the right. 1,678.6 Beautiful gum tree area. 1,681.2 Crossing Little River and wild roses are growing on the embankment. There appears to be quite a number of inns or places one could stay but I think one need to phone ahead to book accommodation in this area. 1,683.3 Mendocino, established 1852, and as we are come into Mendocino we cross a big bridge over Big River. 1,683.8 10:56 Turning off the highway to go through the Mendocino business district. I remember being here with Stu, my son, in 2,000 and was impressed with the wooden water tanks. Perched on the bluff overlooking the river and the ocean, the town of Mendocino is not only classically picturesque, but it is also one of the best examples of a vibrant historic landscape where people carry on everyday lives amidst the delightful and enduring legacy of the 19th century. The overall harmony of the streetscapes and the consistency of the historic townscape have their roots in the foresight of the citizens who in 1971 placed this town on the National Register of Historic Places. One of the earliest district nominations in California, this helped preserve and acknowledge the importance of Mendocino, a place that figured importantly in the development and the economy of the Redwood coast following statehood. Most historic districts in this country consist of small sections of a larger more developed city, but historic Mendocino is the town itself and this creates a dynamic that is evident as one walks the streets. While visitors come to enjoy the historic townscape, the residents are also using the post office, the library, the school, and the grocery store. Even the more recent additions seem at home and do not detract from the character and feel of this once bustling lumber mill town. The pathways, the hills, the empty lots, the orientation of the town, all ground us in the present while at the same time transport the visitor and resident alike to an earlier time when towns were walk-able and human in scale. The views both near and far are composed of vernacular, yet sophisticated buildings, water tanks, cemeteries, dirt paths, overgrown vegetation, and colorful gardens all set amidst the rocks, cliffs, ocean, and the mouth of the river. Whether familiar with the town, or a new visitor, the historic landscape will reward those who take the time to appreciate this rich and diverse landscape. For more than a century, Mendocino water towers and accompanying windmills have captured the attention of visitors and writers alike. In 1892, one reporter observed during her stay, "an individuality about the water works of this town not found in any other place." Early settlers were blessed with plentiful water supplies from nearby creeks and rivers, which facilitated the luxury of piped water into the house. All one needed was a windmill tall enough to catch coastal breezes to power the pumps, and a tank positioned high enough to provide adequate water pressure. Today, most of the windmills have disappeared, but dozens of towers are left standing, ranging from completely restored to a few precariously leaning. Others have been converted into service for such purposes as an artist studio, rental unit or gift shop. You can learn more about the preservation of these unique structures by visiting the Kelley House Museum. Also, it was great driving through Mendocino looking at the many lovely gardens. It was here that I noticed some Echium, the spikes taller than any I had seen previously. 1,685.1 11:06 Back on the highway. 1,685.8 11:07 Fort Bragg 8 miles. 1,688.0 This is a section of road where people could actually pass - no double lines! For the most part we have had double yellow lines down the center for the whole way. 1,689.5 Back into some fog and little droplets are gathering on the windshield from the fog as we drive through it. 1,691.8 A dead deer at the side of the road. 1,694 11:21 - 11:57 Safeway, Fort Bragg - it was time to buy some supplies ($20.00). 1,702.0 Under a canopy of trees, a mixture of gum and cypress. 1,703.5 12:21 Crossing Ten Mile River. 1,704.3 12:23 Pulled off the road for a picture in this little cove. 1,704.5 A gorgeous canopy of cypress trees. 1,707.6 Vista point just ahead but, because the fog is rolling in again, there is no point in stopping. 1,708.8 We turned inland as we came to a valley and we could see the road winding back towards the ocean on the other side. Another sign for tsunami hazard area which means all this coast could be affected in these very low lying areas. 1,709.4 Back to the point which I could see ahead when we turned inland. An embankment is covered with poppies which come right down to the edge of the road. Other embankments have lupin on them. Looking across to the other side where the shoulder drops away there is a cliff with lots of flowers. It is very beautiful at this time of the year. 1,719.2 Still going through redwoods absolutely gorgeous there is lots of for get me nots growing along the shoulder of the road just after we left our lunch spot this is an absolutely magnificent drive driving through the forest. 1,720.2 12:53 - 1:14 Lunch in the redwoods. 1,726.4 1:27 Stopped at the red light for a one lane bridge. 1,730.2 Leggett 9 miles US-101 9 miles. 1,734.6 1:48 - 1:56 I backed up because I saw some wild iris flowering on the embankment. As I photographed them I noticed a much smaller flower with which I am not familiar. 1,739.4 2:08 Turning off CA-1 just before the junction with US-101. 1,739.5 Entering Leggett, pop. 315, El. 952 feet, and driving through a redwood forest. 1,740.0 2:15 - 3:00 Turning in for Drive-Thru Tree Park, a privately owned park where you can drive through a 315 foot tall coastal redwood named Chandelier. The entry fee is $5.00 and we were told we would have to turn our mirrors in before driving through the tree. I drove through a couple of times so Mary could take pictures for both of us. 1,740.6 End of driving through. Before leaving we visited the gift shop as well as walking around the grounds. For here we sense life’s proper goal. 1,740.9 3:03 We are now 680 miles from Canada and 740 miles from Mexico. 1,741.4 3:05 CA-1 ends at the junction with US-101, so now we will be taking the US highway north. 1,748.3 3:17 Confusion Hill, which is half way between Canada and Mexico, is just ahead of us. There was some information back at Drive Thru Tree about it but we think it is just one of those tourist traps! 1,749.3 Start of the freeway. 1,756.9 3:26 Entering Richardson Grove State Park. We left the highway briefly to go into the park as this is where Michael and I camped one night during our 2000 trip. 1,758.3 3:35 Back on the highway. 1,765.5 3:44 Passing the first exit for Garberville, and there must be a motel here because I see a sign for a Best Western. 1,769.9 3:49 Welcome to Humboldt Redwoods State Park and the Avenue of Giants. There is an information sign at the side of the highway and now we are heading off to the exit for the Avenue of the Giants. 1,772.3 3:58 Exit-645 leaving US-101 for the Avenue of the Giants. 1,772.5 3:54 We have stopped to pick up pamphlets about the Avenue of the Giants. 1,772.8 3:57 Eureka is 61 miles. 1,778.6 Miranda, El. 330 feet. 1,780.3 4:13 - 4:24 Stopped to hug a tree! We were about ready to leave when we met a local person who told us about the Flood of ‘64 and, and, looking it up on The Web, it is an amazing story. We are in a beautiful area and this is an absolutely magnificent drive - just no other way of describing it. The trees are huge and apparently we are to see still bigger trees as we further north. 1,781.5 Myers Flat. Fortuna 34 miles, and I think that is where we are hoping to stay tonight. 1,786.2 Williams Grove where there is a camp ground. The trees are so beautiful and it is just so magnificent it is taking my breath away. 1,793.5 4:53 Turned off for Founders Grove. 1,794.0 4:55 We went as far as we could in the car and now are diving back and passing the biggest trees. 1,794.5 4:59 Back at the Avenue of the Giants. 1,794.8 5:00 Leaving the Avenue of the Giants we are on the ramp for the freeway north to Eureka. 1,810.6 Earlier when I said the gauze was in flower it is actually broom and the hillside are covered with yellow broom. 1,815.2 A lighted sign across the road: May is Bike Month. This explains why we have seen dozens of bikes on this trip. 1817.5 Fortuna City Limit. Kenmar Road is the exit we want. 1,818.4 5:24 Left at Exit-687. 1,818.9 5:31 Best Western Country Inn - Room 107. After unpacking the car we walked around the large courtyard looking at all he magnificent flowers which were blooming, roses, rhododendrons in a variety of colors, camellias, tea tree, and other plants. What a day we have had enjoying such a variety of God’s glorious creation, first driving along the coast, then through the redwood forests and finishing up with so many lovely flowers. Today we will continue heading north and will be driving through more Redwood State Parks as well as the Redwood National Park on our way to Crescent City and beyond. When I was flying back from Europe in 2012 I read in a magazine article about the redwoods of Northern California and it said that if a person had never been there it was definitely something they should add to their bucket list. This was certainly a lovely motel with its beautiful gardens, very comfortable room and a nice breakfast - just a delightful place to stay. 1,818.9 8:34 Pulling out from Room 107. 1,819.4 8:36 Back on the highway, US-101 north. 1,830.9 Around a bend and I can see the coast. The tide is out and there looks to be a lot of muddy flats. We are also in a Tsunami Hazard Zone. 1,834.0 A big stone wall right along the foreshore. 1,835.0 8:51 Eureka City Limit, El. 44 feet. The freeway ends. 1,839.9 9:01 Crossing Eureka Slough. Today is not the nice sunny day that we had yesterday. Even with the fog you knew it was a sunny day, but here it is cloudy and rain is threatening. 1,841.4 We have an avenue of gum trees on the left. 1,843.8 9:06 Entering Arcata. We have just driven right through Eureka and now Arcata, and we are very pleased that we stayed in Fortuna. The person we met along Avenue of the Giants did not recommend our staying in Eureka, but rather Fortuna or Arcata. We definitely think we made the right choice. 1,857.9 The weather is deteriorating and we are driving into fog still with reasonable visibility but not the lovely sunny day we could have hope for. 1,859.4 The fog is becoming thicker. Rhododendrons at the side of the road and we have been seeing lots of lupin and other flowers. 1,861.9 Lots of rhododendrons flowering in a lovely variety of colors. 1,862.5 The fog is fairly thick now. 1,863.8 Daises on the embankment. 1,868.9 A sign indicating the end of the freeway. 1,870.3 Back onto a two-lane road with a canopy of trees overhead and winding through the redwoods again. 1,872.3 This is also right on the coast. 1,879.9 9:46 Turning off to read the signs about the Redwood National and State Parks. Lupines are in full bloom and just lovely. 1,880.2 9:48 - 10:26 The Thomas H. Kuchel Visitor Center. A lady by the name of Kimberly was very helpful at the Visitor Center. She went to a lot of trouble producing books and going through them in an attempt to name the flowers we had seen yesterday. 1,880.4 10:27 Back at US-101. 1,881.5 10:28 Entering Orick, and there is a flock of sheep in a paddock to my right, lots of redwood carvings to my left. 1,887.4 10:38 Leaving US-101 for the National and State Scenic Parkway - Exit-753. 1888.5 10:40 - 10:47 We are taking the scenic route for awhile rather than the freeway and have stopped at a pull off in the redwood forest just north of Orick. It is just beautiful here. Maybe I will take a picture of the big tall tree that has seen better days, but is still standing - maybe has been struck by lightening! It is so lovely just drifting along the road, the tall trees on either side. I am so pleased with the plans that I made for this trip with shorter distances each day because there is just so much to see and to enjoy. 1,896.9 11:02 End of the scenic root and returning to the freeway. 1,900.6 Crossing Klamath River overflow as we come into Klamath (Klamath California not Klamath Oregon). 1,900.8 A long bridge, golden bears at each end and both sides of the road, crossing the Klamath River and I wonder if this is the same river that comes down from Klamath Lake in Oregon. The Klamath River originates on a plateau east of the Klamath Mountains in south-central Oregon. Among its sources are underground springs that emerge from fissures in volcanic rock; the Wood, Sycan, Sprague, and Williamson rivers; marshes and wetlands; and Upper Klamath Lake, the largest body of fresh water west of the Rockies. The Klamath, a haven for many species of wildlife, is fourth in volume among the rivers of the West. From its headwaters, the Klamath rushes 254 miles to the Pacific Ocean, traveling southwest through steep mountains in northwestern California until reaching its largest tributary, the Trinity River, at Weitchpec, California. From the confluence, the river changes course, flowing northwest toward the coast. 1,906.6 Trees arching over the road. 1,906.7 11:18 Turning off for Trees of Mystery. It is raining! 1,906.8 11:19 - 12:19 Trees of Mystery is a roadside attraction and "tourist trap" in Klamath, California. The trail began at one side of the parking lot where there were oversized statues of Paul Bunyan and Paul Bunyan’s blue ox. We did not pay to walk the trail, particularly because we didn’t want to be dodging around in the rain. However,we did enjoy very much a large private collection of Native American art, crafts and tools. It was permissible to take pictures in the museum (no flash), and although not the best pictures the following is a sample of what to see in the museum. It's amazing when you think of all the things that Maria Martinez accomplished in her life and thereafter. In the late 1800s and early 20th century the world was changing the railroads were becoming the way to travel not only for shipping of goods but for people to come out West to vacation. Sure Maria came along right when things were changing but there was no coincidence here. Maria took herself and San Ildefonso to world-wide recognition with her pottery work. Ironically her family was not very excited about her marriage to Julian Martinez. He really didn't have a craft or a sure way of providing for a wife and family. Julian could farm but he didn't really like to farm nor did he have much land to be able the farm on. But Maria knew he was the one and she told her mother although life would be uncertain she was ready to devote herself to life with Julian. It didn't take long for Maria and Julian to start on their journey. Literally days after their marriage they went to the St. Louis World's fair of 1904 to perform native dances and craftwork. They got paid well for their efforts although they were away from home for several months. Then an amazing thing happened with the excavation of 1908 and 1909 by Dr. Edgar Lee Hewitt. While doing in the historical excavation just north of the San Ildefonso Pueblo the crew uncovered some prehistoric pottery which was different then the current San Ildefonso style. Dr. Hewitt asked Maria if she could re-create the style of pottery they found in the expedition. And she did. As Maria and Julian developed the new black on black style taken from the past it created a rush of popularity not seen before. With the advance of the railroad and more people being able to travel on vacation this combination created an explosion in San Ildefonso Pueblo pottery craft. Maria passed away on July 20, 1980 a Sunday. She left us a great history and she also left us a lot of relatives who continued in her tradition. Many of her grandchildren, grand nieces grand nephews are currently excellent potters continuing the San Ildedfonso tradition including the black on black pottery. Sandra Chaparro her grand niece is one of the few continuing in the tradition of large plate designs. 1,907.1 12:22 Back on the highway. 1,908.2 Driving right along the coast watching waves come in over rocks out in the water. The steep cliffs on the right are a surprise. 1,909.0 Back into fog again. 1,910.4 End of four lanes and another 1-lane road ahead. They give you plenty of warning with a flashing sign and now I can see the red lights through the fog and the cars that are stopped. 1,911.6 12:31 Soon after passing the traffic light we were back into the redwood forest and there are lots of rhododendrons growing underneath the trees. 1,914.9 The sun is out now, at this point anyway, and we are still seeing rhododendrons and the bright yellow flowers of the broom against the redwoods makes it very colorful, too. 1,916.4 Back into a bit of fog. 1,917.2 A brake check area, then a 7% downgrade through the fog. 1,919.9 Now, after that steep downgrade and driving through more forest we are back at the coast again. 1,921.2 It is very pretty driving right along the foreshore. 1,921.9 12:47 Entering Crescent City, El. 44 feet. 1,922.9 12:51 - 1:05 Visitor Center, Crescent City. A lady by the name of Kimberly was very helpful at the first visitors center we went to she really brought out books and went throughthem looking for the names of the flowers that we had seen yesterday. 1,926.3 1:13 We have turned around on Elk Valley Road and are returning to Howland Hill Road. The rhododendrons throughout the area are magnificent and display a great variety of colors. 1,928.0 1:16 Back at the road we should have turned on in the first place, Howland Hill Road. 1,929.2 1:20 Entering Jedediah Smith Redwoods State Park. 1,929.8 1:24 - 1:44 Pulled off at the side of the road to have lunch. 1,229.9 Where does the road go? 1,932.2 A section of the road which really is just a single lane weaving in between these huge redwoods. 1,934.0 2:14 Road divides and to the left is Stout Grove. Here we rejoined a paved road, and it is now 3 miles to US-199. 1,934.3 Back at the Y junction where we turned off for the Stout Grove Trail ... 3 miles to US-199 and 6 miles back to Crescent City. There are ferns everywhere and the pink rhododendrons sprinkled in all amongst the trees are just beautiful. 1,935.7 There are a lot of houses both sides of the road after we exit the park. 1,936.1 3:18 A little covered bridge. 1,936.8 Crossing a river and there appears to be a canyon up to the right. I don’t know if that is the Smith River as there is bigger river ahead - bridge built 1855 to 1952. 1,937.2 3:31 Crossing the river and immediately over the bridge we come to the junction with US-199, which is named Redwood Highway. Here we turn left. 1,937.7 Sign: Crescent City 10 miles. 1,939.1 3:24 US-199 reenters the Redwood National and State Parks and shortly after that we turned onto CA-197 which will take us back to US-101. A marker indicated that Oregon was 17 miles and Crescent City 16 miles. 1,946.7 More redwoods just before we come to the junction with US-101. 1,947.0 3:35 Junction with US-101 north and it is 10 miles to Crescent City 11 miles to Oregon. There is actually some blue sky to be seen to our left, but the weather has not interfered with us today at all. 1,954.7 Back by the ocean. 1,957.5 3:48 California/Oregon State Line and turning into the Oregon Welcome Center. 1,957.9 3:50 - 4:06 Oregon Welcome Center. 1,960.5 4:10 Turning off on a side road to see one of Oregon’s largest trees, the state’s largest Monterey cypress. 1,960.9 4:14 Back at US-101. 1,973.7 Crossing the highest bridge in Oregon, the road is well above the beach front. This is after going north past Whales Head Beach where we get glimpses of the ocean every now and again between headlands. There are lots of rocky outcrops in the water. The stretch of US 101 between Brookings and Gold Beach includes the highest bridge in Oregon, the Thomas Creek Bridge. With its roadbed at 345 feet (105 m) above Thomas Creek, is the 15th highest bridge in the U.S.
Thomas Creek Bridge crosses Thomas Creek in Curry County, Oregon, U.S. It is on US Route 101 and lies within the boundaries of Samuel H. Boardman State Scenic Corridor. It is a Warren deck truss designed by Ivan D. Merchant. Built in 1961, it has a length of 956 feet (291 m) total, and a deck width of 30 feet (9.1 m). The longest span is 371 feet (113 m). The bridge is the highest bridge in Oregon, at 345 feet (105 m) high. 1,982.6 4:41 Stopped at a red light for work being done on a bridge over the Pistol River. 4:43 Green light and going forward, right where the river goes out across the beach into the ocean. 1,994.3 Starting to cross the beautiful historic bridge over the Rouge River. I turned of the highway momentarily just for a short distance to try to capture a picture of thebridge. 1,995.0 5:00 Back on the highway which for the most part is a 2-lane road, but every now and again there is a passing lane. We are fortunate that there is not much traffic on the road tonight and it is just lovely, as Mary says, just drifting along the coast. With very little traffic at present it is a truly pleasant drive. 2,008.2 Oh dear I just happened to look at the millage. We have done 2,008 miles since leaving Tucson. 2,016.0 5:25 Passing Humbug Mountain Campground. I mention the Humbug Mountain State Park because that is where Michael and I camped in 2000 when we went on our camping trip down through California. 2,024.8 5:352 Port Orford Heads, and I need to start thinking about getting gas, probably in Bandon. 2,047.7 6:00 Coming into Bandon. 2,051.3 6:31 Room 136, a pleasant room looking out on the golf course. 2,051.3 8:32 Leave Room 136, Best Western in Bandon Oregon. Our first stop after leaving from our room before going to pay the bill was to pick up a golf ball in the middle of the road! 2,051.5 8:41 Leaving the office after paying and checking out. Our plan today is to follow the coast north for a while then go inland to the Interstate. 2,052.8 8:45 - 8:48 First stop for pictures along the coast. 2,053.9 8:53 Back at US-101 and turning north. 2,055.0 8:56 At the junction for OR-42S, the road to Coquille, and the one I originally thought I would take to I-5 but we will stay by the coast for a while before cutting across. 2,057.0 Crossing the Coquille River and although US-101 is not near the beach there are lots of roads going to the beach where there are state parks. Pine trees line both side of the road. 2,060.4 Irrigation sprinklers on the fields to my right. We are seeing thousands of pine trees but they look rather puny after the redwoods we have seen. 2,073.3 A big saw mill on our right and after passing that we were driving beside a river so we going through the river valley. Also we have a small railway line at the right of us as well as the river. 2,076.5 We are still going through the river valley and ahead I can see more piles of logs. 2,077.2 Another big saw mill to my right. 2,077.4 A sign for Coos River. We had thought at one point of coming along as far a this town if we could not get something suitable back in Bandon. 2,078.6 An old historic train at the side of the road at Coos Bay Lumber Company which would have used the narrow gauge railway. 2,078.9 An historic boat under a shelter, also a boat in the river. There is a number of boats, fishing boats, along the river front. This looks to be a very interesting and historic place. 2,081.9 Passing another large sawmill and there is a big bridge ahead. 2,082.7 9:33 Start to cross the bridge. This is quite a bridge and very interesting. Some sections are built high enough to allow boats to go underneath. 2,083.7 End of the bridge. The Conde B. McCullough Memorial Bridge, formerly the North Bend Bridge is a cantilever bridge that spans Coos Bay on U.S. Route 101 near North Bend, Oregon. It is one of a series of eleven major bridges on the Oregon Coast Highway that were designed under the supervision of Conde B. McCullough, replacing ferries that had formerly crossed the bay. The bridge is outstanding for its attention to form and detail, and has been placed on the National Register of Historic Places in recognition of its design and cultural and economic importance. Work started on what was then called the North Bend Bridge on July 10, 1934.The bridge opened in June 1936. When the bridge was completed in 1936 it was the longest bridge in Oregon. It was the costliest of the Oregon Coast bridges at $2.14 million (equivalent to approximately $35 million in 2012). Because of the long spans and heavily trafficked shipping channel, a cantilever construction was deemed most suitable; a draw span was rejected because it would have to be opened too often. Consequently the 793-foot (242 m) main span has 145 feet (44 m) of vertical clearance and is part of a 1,708-foot (521 m) long steel cantilever span. Overall length, including the concrete approach spans is 5,305 feet (1,617 m). The approach spans are concrete arches more typical of McCullough's designs. The main roadway is 27 feet (8.2 m) wide with 3.5-foot (1.1 m) wide sidewalks on either side. The main towers rise 280 feet (85 m) above the water surface, with curved sway bracing in a Gothic arch style. The open-spandrel concrete approach arches vary in span from 265 feet (81 m) to 151 feet (46 m). The ends of the bridge are marked by pedestrian plazas meant to provide a viewing point for the bridge and to provide access to the shoreline. These plazas are detailed with Art Moderne motifs and are provided with built-in benches. The stairs are descend in sweeping curves to the park below. 2,084.3 Entering Oregon Dunes Recreational Area and the road is built up crossing mud flats. 2,084.9 We are just coming to the end of the built-up road over the mud flats and going back into the hills. We can see the sand dunes to our left. 2,093.3 9:45 - 9:48 Stopped to study the map and decide which route to take inland. We decided not to take OR-38 out of Reedsport as Mary did that on July 13, 1995, but rather go north as far as Florence then cut across from there to Eugene. 2,104.3 10:00 Entering Reedsport. Lots of rhododendrons are flowering. 2,106.1 Passing the turnoff for OR-38. 2,106.4 Starting to cross the historic bridge over the Umpqua River, a big river. 2,106.7 End of the bridge. 2,107.2 Crossing the Smith River, a tributary of the Umpqua River, and here there are a lot of mud flats. 2,107.5 The end of the bridge. 2,116.1 Sand dunes to the left of the road and we are seeing rhododendrons, broom, pine trees and cypress trees. 2,121.5 Just after a sign for Dunes City the dunes come right down to the roadside on the left. 2,123.7 An embankment of rhododendrons both sides of the road and pine trees behind them. Then the pine trees come right down to the road. 2,124.0 What a beautiful drive! The pine trees we are seeing here are somewhat bigger than the ones we saw back further and they have lots of rhododendrons among them. They are just beautiful and it is interesting that for the most part the flowers are the same color pink. However, when you get into residential areas and see the shrubs people have in their gardens there is a much bigger variety of colors. 2,127.0 Welcome to Florence and starting of the bridge across the Siuslaw River. 2,127.4 10:28 End of the bridge. 2,127.9 10:30 Leaving US-101 for OR-126, the Florence-Eugene Highway. Eugene is 59 miles, Mapleton 14 miles and Springfield 63 miles. When we first set out we are driving along the north side of the river. 2,129.2 We seem to be crossing a fork of the river and at the moment there are mud flats and there is a marina on the river. We are just drifting right along the river bank and it is beautiful. Judging by the bank I suspect the tide comes into this part of the river, but it cannot do so much further as the road goes uphill. There are railway tracks to our left. 2,136.5 We have a bit of a creek besides us and the main river with houses along it is further over. 2,140.5 We are still alongside the river but have moved away from it a bit and are still going through the hills in the same valley as the river. The last time I looked at it, the river was still tidal. There are cattle and horses grazing in the field beside the river. 2,141.9 10:46 Entering Mapleton where we cross the Siuslaw River. 2,142.7 There are many landings along the river, and houses. Having crossed the river we will be leaving the river valley and driving into the hills which have been clear logged and will be replanted. 2,143.8 A house with a beautiful garden of rhododendrons with a wide verity of colors. 2,148.2 10:54 End of the tunnel. After the tunnel the road starts to go downhill, winding through the hills and has trees leaning right over it, boughs forming a canopy in parts. 2,164.7 11:14 El. 769 feet. Some people think this is high but they do not know where we have been!! 2,166.3 Orchards both sides of the road probably pear or apple. 2,168.1 Deep pink hawthorns in flower. There is so much broom growing all through here the countryside is absolutely brilliant yellow. 2,175.6 11:27 A stop sign in this little town of, or near, Veneta. The town itself is off to the right. 2,177.8 A big lake to the left. 2,178.9 There is water on the right side of the road as well. 2,183.8 11:37 A sign: Welcome to Eugene, pop. 138,000. 2,185.3 11:42 - 12:12 Target in Eugene. 2,185.6 12:15 Back at the corner where we should have turned in the first place, but in the mean time we had our lunch at Target, a roasted tomato and mozzarella panini which was very tasty. 2,195.5 12:27 On the ramp for entering the Interstate, I-5. 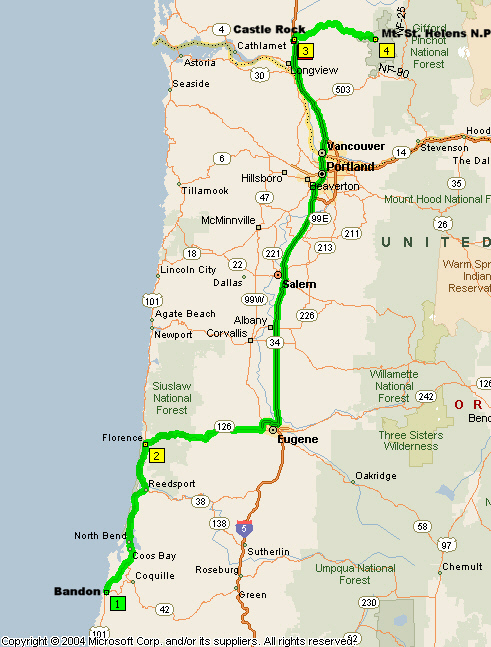 2,197.0 12:28 Portland is only 105 miles, which is less than two hours away. Originally I thought that we would have stayed in Vancouver, Washington, but now I am thinking that we better go further than that. Albany, Linn County, and surrounding communities are major exporters of grass seed. 2,241.0 An area of vineyards. 2,261.4 1:26 Crossing the 45th Parallel, so we are half way between the North Pole and the Equator. 2,290.4 1:52 Passing Exit-288 for I-205, the route we would have taken originally if staying in this area but it is still early in the day and there is no point in not going further. 2,294.8 Passing the Mormon temple on the right. 2,298.1 2:00 As we approach Portland traffic is becoming much heavier. 2,310.5 Start of the bridge over the Columbia River. 2,310.9 2:15 Entering the State of Washington. 2,321.7 2:26 Leaving the highway for a Rest Area. As we were coming into Portland I noticed that Mount Adams was visible in the distance above everything else on the horizon. 2,322.5 2:28 - 2:45 Rest Area. 2,359.7 3:17 Leaving I-5 at Exit 48 in Castle Rock., this being the exit for Mount St. Helens National Volcanic Monument. Both Mary and I had visited The Monument previously, butonly Windy Ridge which is reached from the east. This time we wanted to drive in from the west. 2,362.6 3:26 Timberland Inn & Suites, Castle Rock. 3:34 - 3:38 Room 214. We put our things in the room then left for Mount St. Helens on WA-504, named Spirit Lake Memorial Highway. Today is four days short of thirty-three years since the eruption of Mount St. Helens changed the landscape. I remember the date well because I was returning with my children from Australia and had intended traveling by bus from los Angeles to Vancouver, but decided to fly instead. 2,363.7 Turned around because I realized that I needed to get gas before going into the mountains. It was good that Mary asked about the gas because I had intended to get it anyway but it kind of slipped my mind when we decided to go this afternoon instead of in the morning. As we drive along this road there are signs at intervals saying when the forest was replanted, 1985 and 1986, that is 5 or 6 years after the eruption of Mount St. Helens. 2,387.0 4:18 El. 1,000 feet. 2,398.3 4:33 - 4:37 Turning into a Rest Area and viewpoint. 2,402.7 4:45 Passing a break check area. 2,403.0 Starting to go down hill and there is snow on the shoulder. 2,413.4 You can see all the dead stumps from the trees that would have been lost when Mount St. Helens erupted. There is not a lot of growth on the hillside to my left, maybe some aspens and very few pine trees. 2,415.2 Another 3,000 foot elevation as the road dips and rises. 2,417.2 Mary has just pointed out that you can still see the dead trees on the hilltops which are quite bare except for all the dead trees lying there. 2,419.0 The sign for Johnson Ridge National Volcanic Monument Observatory. 2,419.2 5:13 - 6:14 Johnston Ridge, Mount St. Helens. 2,420.0 We just passed the 4,000 foot marker, but I will refrain from mentioning other elevations as we return to Castle Rock. When Congress established the 110,000 acre Mount St. Helens National Volcanic Monument no salvage and no tree planting were permitted within the monument, and thus the natural evolving environment will be preserved. 2,436.6 A sign for a plantation planted in 1983, that is 3 years after the Mount St. Helens eruption. 2,442.3 6:48 Turning into a bridge viewpoint on the edge of the eruption zone. 2,442.5 6:49 - 6:56 Stopped at the bridge lookout. In addition to the bridge there were other interpretive panels about the Weyerhaeuser Company involvement. 2,472.4 7:32 Back at the motel, Timberland Inn & Suites, a late night for us but this meant that tomorrow could be a more relaxed day. We really enjoyed the side trip to see Mount St. Helens. 2,472.4 9:04 Leaving from Room 214, Timberland Inn and Suites in Castle Rock, and we have decided that our destination today will be Sequim. 2,473.1 9:06 On I-5 and we are getting a sprinkling rain. It is a good thing we went to the mountains yesterday when it was absolutely gorgeous. The rain hasn’t developed, just a few little sprinkles which we are likely to get throughout the day if the sky does not clear. 2,482.0 Crossing the Cowlitz River. After crossing White Pass, Route US-12 follows the Cowlitz from its source near Mount Rainier National Park through the river valley. 2,491.3 9:22 Passing the exit for US-12 to Yakima. 2,499.5 9:29 Leaving the highway at Exit-76 for Chehalis. 2,502.8 9:40 - 10:03 Safeway, Chehalis (established 1883) - groceries $7.09. 2,517.7 10:20 - 10:28 Pulling into a Rest Area, a half mile from the highway. 2,518.8 10:27 Back on the highway. 2,531.6 10:38 Leaving the highway at Exit-104, Olympia, capital of Washington State. 2,535.8 10:46 - 11:21 Washington State Capitol. We found a place where we could park the car and walk to the Capitol. The rhododendrons were all in flower, also azaleas, but the cherry trees had finished blooming and were in leaf. 2,536.6 11:24 Back on I-5. 2,538.0 11:25 The GPS is indicating that we could be in Vancouver in 4 hours. However, since we are taking a detour we will not be there until tomorrow. 2,543.5 A lot of California Poppies in bloom on the shoulder and in the median. 2,546.3 11:34 Crossing the Nisqually River. We are going to leave the highway at Exit-132 for WA-16 west up through Bremerton. 2,563.3 11:50 Off the interstate. 2,568.7 11:87 Passing Exit-4 and there was a sign for a bridge ahead, the Tacoma Narrows Bridge, a toll bridge, but not in this direction. The toll is collected only on those vehicles driving into the city. 2,569.3 Start of the bridge, which has three lanes each way, one of them being a HOV lane. 2,870.4 End of the bridge. 2,571.0 Passing the toll gate for the traffic going into the city. 2,572.6 Down to two lanes and the HOV lane has disappeared. Some blue sky is showing and it is quite warm. The traffic is not bad as we are drifting along at 60 mph. We are enclosed in walls of trees both sides of the road, which still a freeway. The roadsides are very colorful with the brilliant yellow flowers of the broom. 2,589.5 12:17 Freeway ends in 1 mile. 2,592.3 Driving beside the water about 1½ miles before Bremerton. 2,593.4 Got a glimpse of some of the naval boats here, then we were back into the trees again. 2,596.9 From the crest of a hill I can see water ahead. Exit-43 for Newberry Hill. 2,600.5 We are leaving the highway in the hope of finding a place, somewhere near the water if possible, to have our lunch. 2,601.9 12:35 - 12:55 We had lunch in old town Silverdale down near the water. 2,619.6 1:17 A traffic light at the junction with WA-104. 2,619.8 Start of the bridge, part of which is a drawbridge, across the waterway. 2,621.3 1:19 End of the bridge. 2,623.5 We can still see water through the trees to our left. 2,626.3 Starting to rain - a light sprinkle. 2,635.8 1:34 Junction with US-101 north to Port Angeles. 2,637.8 1:37 Passing the turn off for WA-20 to Port Townsend. We will return to this point tomorrow for the last leg of our journey to Vancouver. 2,638.4 Sequim is 17 miles, Port Angeles 33 miles. 2,638.5 1:49 - 1:51 Stopped for road work. As we approached Sequim we noticed an Indian settlement. The Jamestown S'Klallam Tribe was formalized by members of S'Klallam communities along the eastern end of the Strait of Juan de Fuca in 1874 when, faced with the threat of forced relocation by white settlers, a group purchased a tract of 210 acres (0.85 km2) and established a community near Dungeness named "Jamestown" in honor of village leader James Balch. This was a notable feat, since at the time Native people were legally barred from buying property. Despite periodic pressures to relocate to reservations, and without the Federal financial assistance that such relocation would have enabled, the Jamestown band maintained its independent community, and developed a viable economic base. century later, after a six-year effort to receive official recognition as a tribe, the United States Department of the Interior granted them such recognition on February 10, 1981. 2,657.1 2:11 Arrive Sundowner Motel. 2,657.1 2:18 - 2:52 Room 122 - After settling into our room, and since it was still only mid-afternoon I suggested going for a drive to see the Elwa River project. I had read about the removal of the dam, the largest dam removal in U.S. history, and how the river was to be restored, and was interested in investigating the area. Just as we were leaving a light rain started falling and continued throughout the afternoon. 2,671.8 3:17 Entering Port Angeles where it is 57°. 2,683.6 3:44 Crossing the Elwa River. A different sign along the road here - Don’t Drug and Drive. I am used to seeing Don’t Drink and Drive! 2,687.7 3:50 - 4:22 Elwa Dam. After parking the car and, in spite of the rain, we hiked long a trail through the woods to a viewing platform. The following are web sites which may interest you if you want to know more about the Elwa River, the removal of dams and the restoration of the river. The following link is a time lapse video of the removal of the dam. The following pictures were captured along the trail as we returned to the car. Paid cash at Arco - 10¢/gal less than paying by credit. I will be leaving US-101 at the River Road exit ro go into Sequim. 2,710.3 5:09 Leaving US-101, daises and poppies growing to the left while I wait for the light to change so I can turn onto River Road. 2,712.2 5:16 Back at the motel - I tripped on a step going into the room and gashed my arm on a verandah post. 2,712.4 Walgreens to get a dressing and some band aids. 2,712.8 End of the day. 2,712.8 8:33 Leave Room 122 in Sequim for the last leg of our drive to Vancouver. 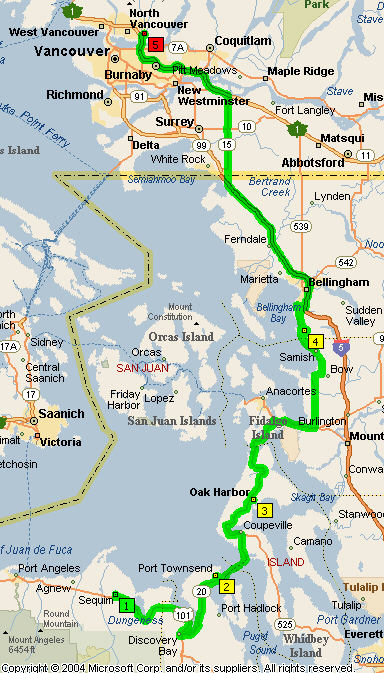 2,713.9 8:37 On US-101 east to WA-20 which is the turn off for Port Townsend. There are lots of daises all along the shoulder of the road. The sun is already high in the sky, a bit of blue sky is showing through the clouds and, although clouds are covering the mountain peaks we can see some snow. 2,717.5 The sun is breaking through the clouds and we are seeing the beautiful flowers of rhododendrons in the woods along the highway. 2,731.9 9:00 Leaving US-101 for WA-20 to Port Townsend which is just 12 miles from here. 2,733.9 Climbing to the crest of a hill we can look down over the waterway through gaps in the trees. Cedars are growing all along the road and whenever there is a slight opening between their trunks or the undergrowth we have lovely views out across the water. There are lots of ferns on the embankment and in some places the trees come right over the road, in other places such as now there is a small gap. It is like driving through a canyon of trees, "like a zipper if you pulled it up." I love that description! Thank you, Mary," and an additional comment, "when the zipper is down the trees do not all fall over." 2,739.8 9:11 A red light at the junction with WA-19, but we continue on WA-20. 2,742.7 Just went round a traffic circle, the second one since approaching Port Townsend. 2,744.8 9:21 Port Townsend ferry $12.75 ($11.20 for senior + car and $1.55 for an additional senior). We are lined up ready to board the ferry, named Salish, for the 9:30 sailing. 9:26 Starting to move forward to board the ferry. 2,744.9 9:27 Stopped on the ferry. It was wonderful timing for the ferry because we did not have to hang around in Port Townsend at all. The ferry is starting to move very slowly, but right on time. 9:59 The ferry is just pulling into the dock so it is a half hour crossing. 10:02 Starting to move off the ferry and now we are on Whidbey Island. It is very foggy and so a little disappointing for the sightseeing trip we are suppose to be doing today. 2,749.7 10:13 - 10:16 We missed turning with WA-20 at some point and have driven right through Coupeville to the waters on the north end of Saratoga Passage. 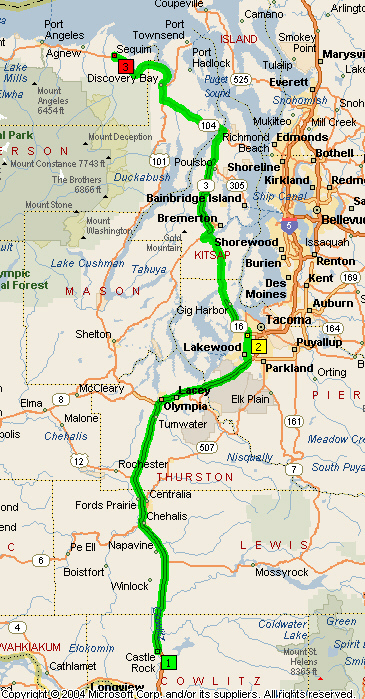 On looking at the map I can see that we need to go back to WA-20 which will take us up through Oak Harbor. In the meantime the view here is through an old part of the town looking over Saratoga Passage. 2,750.5 10:19 Back at the junction with WA-20 but going into Coupeville was a very worth while little detour. Now Oak Harbor is 10 miles, Deception Pass 19 miles. 2,755.3 Lots of lupines flowering at the side of the road. 2,759.2 10:30 Entering Oak Harbor. The banners in Oak Harbor all have tulips in a variety of colors on them as well as what look like sails for sail boats on others. As mentioned earlier the weather today was disappointing, but Mary and I do not let that deter us! We descended the stairs through the woods to get a view of the bridge. One of the things I always enjoy seeing are the colorful trunks of the arbutus trees which happened to be flowering. 2,771.2 11:13 We stopped again on the other side of the bridge where we got a much better view of the bridge. 2,780.5 Although we are getting some sunshine there is also a lot of dark clouds around. 2,782.5 11:35 Leaving WA-20 to turn into La Conner. 2,786.7 11:41 Welcome to La Conner. 11:45 Leaving La Conner. It was too late in the season to see the colorful fields of flowers for which La Connor is known. 2,791.7 11:51 Back at WA-20. 2,798.4 12:00 Junction with I-5. 2,810.0 The clouds are hanging so low we cannot see the mountains on the right. 2,811.4 Now we are getting a light sprinkling of rain. 2,812.6 Bellingham 9 miles, Vancouver 64 miles. 2.817.4 No rain and some blue sky showing. I will be leaving the highway at Exit-262 to go into Ferndale. 2,831.3 12:31 Left the highway. It is 68° here in Ferndale. 2,832.8 12:39 Ferndale Post Office to mail Pat’s letter. She was my Auatralian traveling companion last year. 2,833.4 12:44 - 1:07 Stopped for lunch at the Centennial River Walk Park on the banks of the Nooksack River in Ferndale. Here there were Attractive interpretive markers about the Healthy Riparian Ecosystem, Life Cycle of the Salmon, and about the three totem poles in the park. 2,834.7 1:12 Back on I-5. 2,839.3 1:16 Pulling off for a Rest Area. 2,839.6 1:17 - 1:23 Rest Area. 2,847.0 1:30 Leaving I-5 at Exit-275. 2,848.3 1:42 - 1:58 Duty Free.  Leaving the Duty Free after pick up and struggling to merge into the traffic to cross the border. 2:13 We are through Customs and Immigration, which is pretty quick going. 2,866.0 2:46 Start of the new Port Mann Bridge which is now a toll bridge, but there doesn’t seem to be any toll booths! 2,866.5 End of the bridge. There are clouds over the mountains but we have blue sky and sunshine as we cross the Ironmonger MemorialBridge into North Vancouver. 2,883.1 3:10 Parked outside Stu’s where Anna my son smd daughter was parked to meet the children coming out from school. Today some friends of Mary’s came and picked her up to take her to lunch at the Tea House in Stanley Park. I had an appointment with my favorite hairdresser and did several other errands. Stu and his wife came over with the girls for supper. My birthday! Wow! I’m 80 years old!! This morning Anna took us to Ambleside to see the juvenile elephant seal which was preparing to malt. Stu and family had told us about it. Late afternoon Anna and spouse hosted a cocktail hour at the house before we went to the Pinnacle Hotel for the dinner party, where we met with other friends. We had a private room for the occasion and it was a wonderful evening. 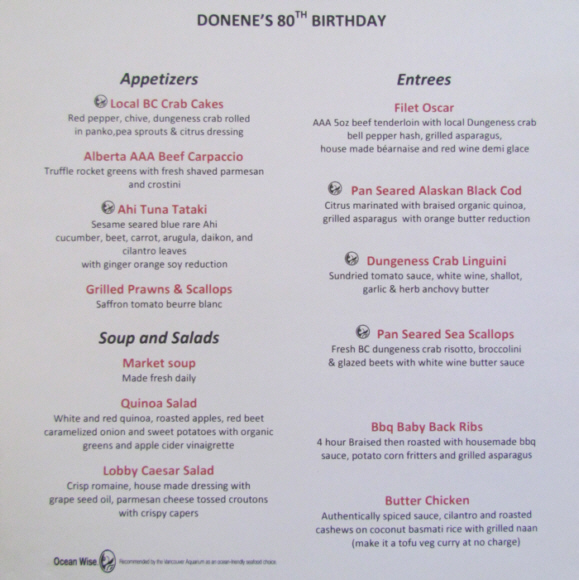 The manager had prepared special menus headed by “Donene’s 80th Birthday” and no prices were included. This meant everyone could be comfortable choosing whatever they wanted. Stu brought a cake and walked in with lit candles (not 80!!) and two grandchildren helped me blow them out. My eldest granddaughter did a PowerPoint presentation of photos of me taken over the years with her and two brothers. I received some very nice gifts - Nikon binoculars, a beautiful Italian silk scarf, a necklace, a print of Mount Baker, an external hard drive for photo storage and a very emotional gift from Alysone, something she had composed and had framed beautifully. helping Warren and I buy our first house. A leisurely morning was spent at Anna’s and Mary and I went to Stu’s in the afternoon to see the progress on his house. Today Mary and I drove to Ladner to have lunch with friends. Originally we were supposed to be breaking a bottle of champagne christening their new boat with its new name “TOY YOT”, then going out on the Fraser River for lunch. Because of inclement weather these plans had to be postponed. Nearby a pair of bald eagles have a nest to which they return every year and today we were fortunate enough to see the eagles in residence. Today’s weather promised to be better so Mary and I took the opportunity of taking a day trip to Whistler. We enjoyed stopping at the various points of interest on our way up the Sea-to-Sky Highway. It was wonderful looking up at Shannon Falls which were spectacular at this time of the year. There is still a lot of snow to melt in the mountains which means so much more water cascading down the falls. Shannon Falls is composed of a series of cliffs, rising 335 metres above Highways 99 making it the third highest falls in the province, ranking behind 481 metre Della Falls in Strathcona Provincial Park on Vancouver Island and 396 metre Hunlen Falls in Tweedsmuir Provincial Park near Bella Coola. The tumbling waters of Shannon Falls originate from Mount Habrich and Mount Sky Pilot. We hiked through the forest to a viewing platform to see Brandywine Falls. Here you are more or less at the level of the top of the falls and look down into the valley. Brandywine Falls (the spectacular 70 metre waterfall) is best seen from the viewpoint hich also presents some marvelous views of Daisy Lake and the surrounding mountains. Before going into Whistler Village we drove out to Green Lake where we had our lunch. 3,053.9 Most of Whistler Village has to be seen on foot but there was a large car park nearby. The ski season was over and summer activities hadn’t really started , so there weren’t crowds of people. The sun had disappeared and the day had become quite overcast and the only really bright spots were the spring flowers. On the return trip to the city we pulled into Tantalus Lookout, elevation 320 meters, but the mountains across Howe Sound were shrouded in cloud. It was the same thing at the Britannia Lookout. We also stopped in Horseshoe Bay and went for a walk through the village and along the waterfront. Again, the dull day did not offer any opportunities for those beautiful calendar type photographs!! Today Mary and I drove into town crossing Burrard Inlet on the Ironmongers Memorial Bridge and went to Granville Island for a soup lunch before visiting a grandson at Sunnyhill. We returned to the North Shore via the Lions Gate Bridge and drove along Marine drive. We stopped in at Michael’s to arrange our ride next morning to the ship for our Alaska cruise.